Doing something you love for too long can leave you in a pickle. Doing something you “love” for too long can leave you in even more of a pickle. I won’t go too deep into my life story, but I just need to first say that sometimes we are so driven to find our dream job that we convince ourselves we have. Guided by our families, mentors, friends, and social media followers’ watchful eyes, we do a whole lot to ensure that we are not perceived as failures. We had clear intentions. We had clear dreams. And we were successful. The truth of the matter is dreams change. Dreams, in a daily/nightly sense, are made up of references from experienced life. They mold, change, and evolve based on your day. The larger life dream, I think, evolves in the same way. There will always be bits and pieces of your life intertwined, but dreams absolutely can (and should) alter course. If they don’t, how do you mark your growth as a human? With all of this being said, I changed course. It was risky, scary, exciting, and ultimately overwhelming, but I hate to say that a large part of those emotions were driven by my perception of outward judgment: How people would make up their minds about a decision that I spent the better part of a full year making. A decision that began with questioning how the outward world (and, therefore, I) categorized myself. Did I choose these labels? Did I accidentally fall into this job? Did someone just say that I was good at something and then I ran with it? If I don’t try something new, am I missing out on a larger potential? College, graduation, move to New York, landed steady job (excited), grew in said job (okay), grew stagnant in job (not so excited), decided a change was needed, set date to leave job. Past this, I didn’t have much of a plan. I decided to take two months to travel, something that I hadn’t done much of despite my keen interest in people and culture. The plan was (against my better judgment) to return with a fresh slate and start new when I returned. I started out with zero expectations other than craving something that would wake me up from the labeled coma I had somehow found myself in. I wish I could tell you that I had some sort of sparkling, fireworks revelation while traveling; A moment of realization about how I wanted to repurpose my life. 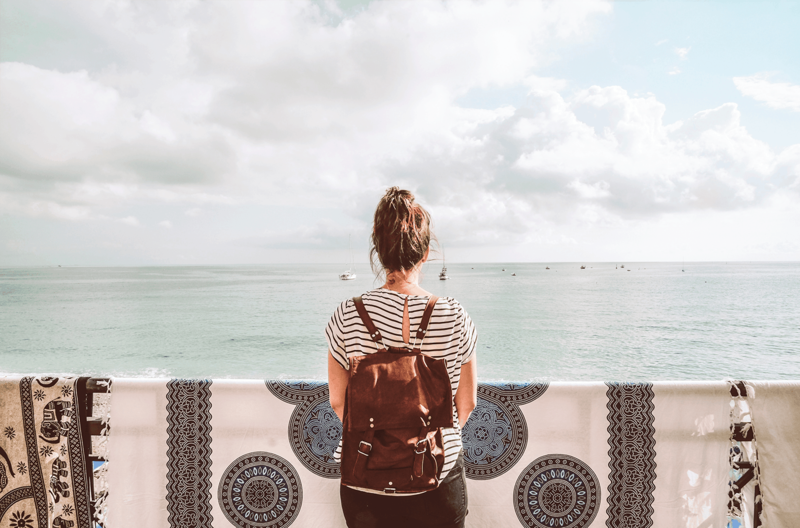 Despite every Elite Daily article you read, that doesn’t always happen when you “Travel the world to find yourself.” My revelation was much more subtle and felt as if it were plainly obvious the whole time. Your passion, dream, identity, and job are not all the same thing and do not need to be neatly categorized into one box. My concept of the word passion had always been associated with dance; A love that had already grown and changed course for 15 years, but neatly fit into one artistic box of my life. Dance and movement grew to be an integral part of my personality, life and being. And it always will be, but as my 20-year-old self once wrote in a college theory paper, “Change is the only constant.” Little did I know, those words would ring loud and clear with a whole new, proven meaning five years later. Just as my love for ballet morphed into a love for modern dance, I have morphed that passion into an emotion. The thrill of finishing a ballet class sweaty, heart pumping, and standing a little taller. The feeling of improvising for a full hour only to narrow in on a single moment’s feeling of your whole body breezing through the air. The mind-tugging moment of reading a book only to look up and visually comprehend that the world is a very real place that holds beautiful people, stories, and history. The fresh taste of completely foreign cuisine prepared by a chef who has cooked with these spices for their entire life. Connecting with a simple violin solo that seems to capture a feeling so perfectly. I am enthralled by moments that remind me of my humanity and connect me with others doing the same. It may seem incredibly vague, but this is what I crave, this is what I love, and why my dream(s) have altered yet somehow remained in the same vein. I truly believe that these moments are why people travel in the first place, to reconnect and to explore senses that awaken them to the world surrounding them. 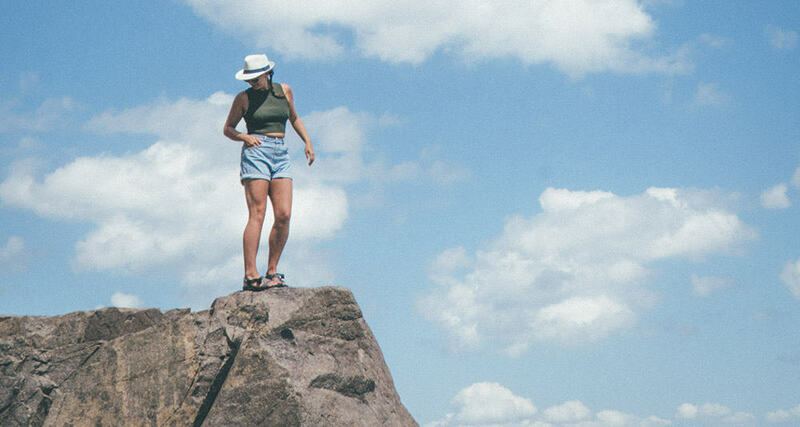 I’m 25, but I fear that many people much older than I have never taken a moment to curiously explore, capture, and meditate on what it is that drives them to do and love what they do and love. Your passion, dream(s), identity, and job should support the others (And they may be in a few fluid piles rather than boxes). Find a way to make it work. For me, this meant finding a flexible job that will allow me to take the time my personality craves to be curious: to travel, to experience, to learn. 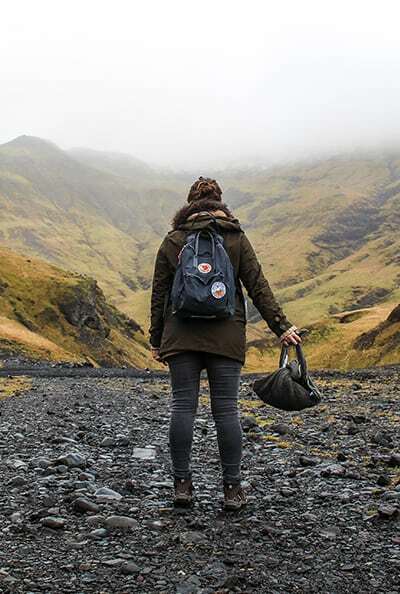 I’ve found new passions, taken steps to dare myself, have started a business, and want to share my experience of being curious in different corners of the world through my business Life Nomading. As an outsider looking in it may seem like a backwards career move, but to me, any move in a career that you aren’t whole-hearted about is backwards. Ireland is arguably one of the most picture-perfect summer road trip destinations. 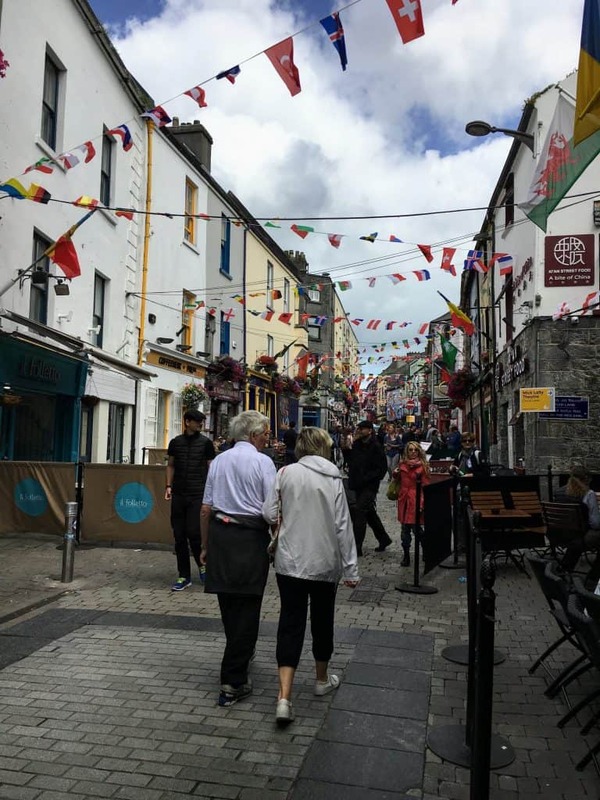 Come to Ireland to see breathtaking scenery, come for the friendly people, come if you want to slow down and get lost in the beauty of the simpler things in life: a cup of morning tea with fresh milk, a stroll through the market stalls, a self guided tour of abandoned castles, a laugh with friends over a pint at the local pub… the list goes on. You could easily spend an entire week in Dublin alone. But what’s the fun in staying in one city when you can rent a car and explore some back roads? Best of all, it’s possible to drive across the entire midsection of Ireland from the East coast to the West coast in about 2 hours. Fun fact: Ireland is slightly larger than the state of West Virginia. Although the country is small in size, there is plenty to see. When deciding the best route for your Ireland road trip it is going to be a tough call! Northern Ireland is known for its epic landscapes: dramatic cliffs, picturesque blue sea, and mythical rock formations. No wonder Game Of Thrones shoots scenes there! The capital, Belfast, is trendy with loads of history. It’s also home to the Harland and Wolff shipyard, the construction site of the Titanic. However, if you are traveling from Dublin up to Northern Ireland things can get complicated. 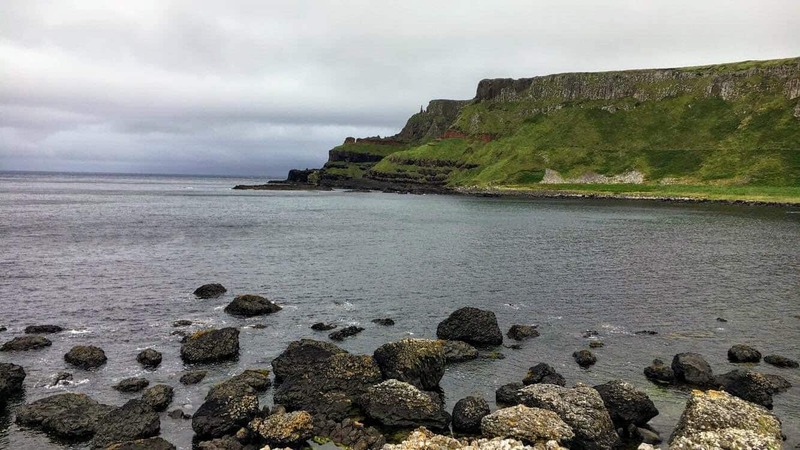 Northern Ireland is a part of the United Kingdom and you will need to pass through border patrol, pay in Pounds instead of Euros, and spend extra on rental car fees. My advice for first-time visitors would be to start in Dublin, head down South, and make your way to the West coast. 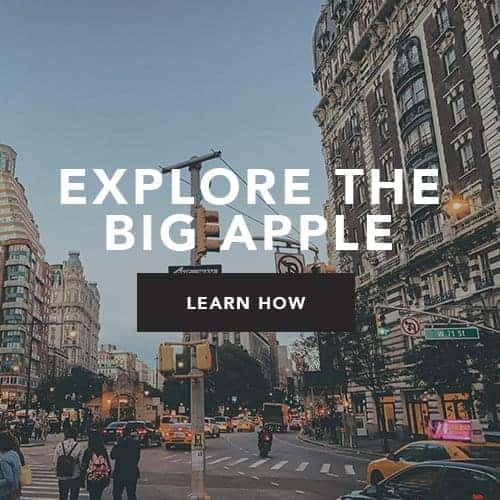 You will be able to see a number of world-famous sights, get a taste of traditional Irish cities, and discover your own hidden gems along the way. For your road trip, I recommend that you give yourself a minimum of 7 days to complete the itinerary that I’ve put together. 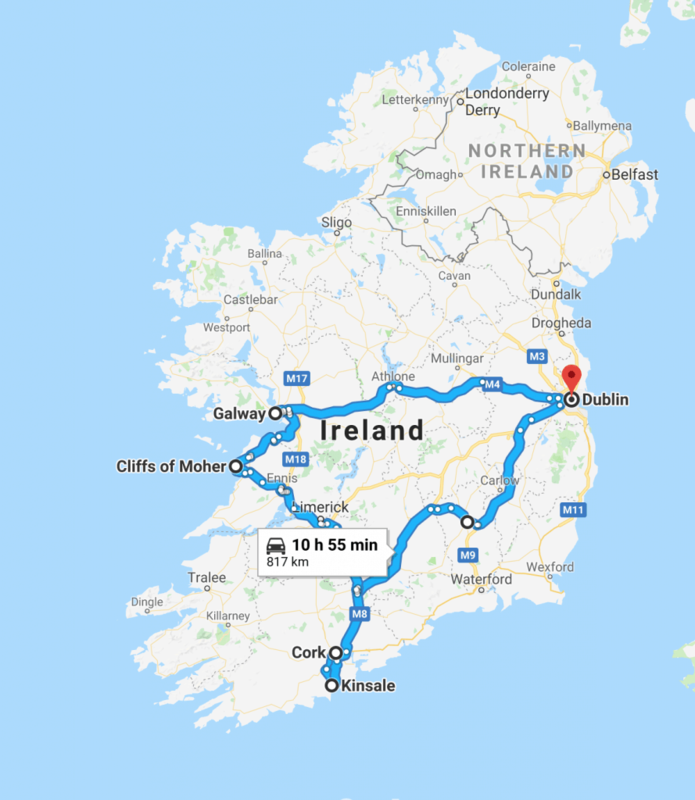 If you’re tight on time, then adjust your route as needed because let’s be real… any number of days in Ireland will be well worth it! 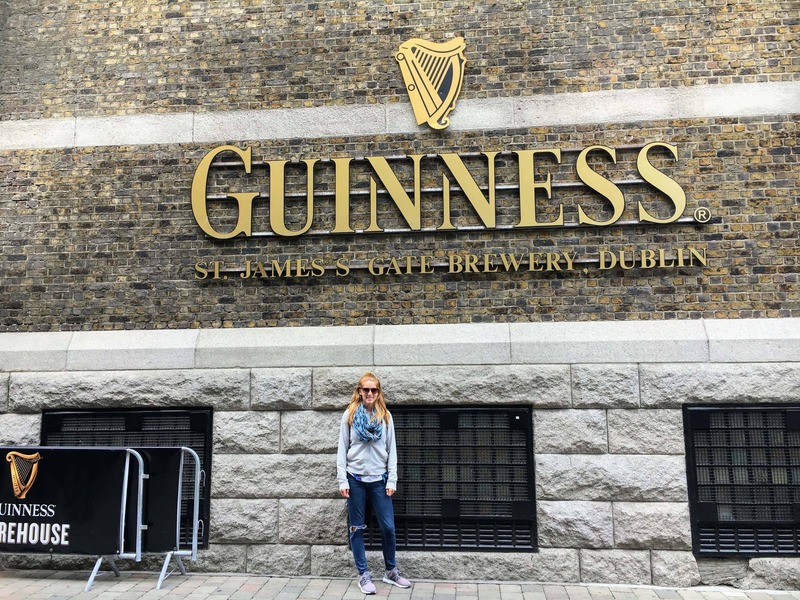 Explore the shops of the Temple Bar neighborhood, watch live music at Dublin’s oldest pub – Brazen Head, or take a brewery tour at the Guinness Factory. 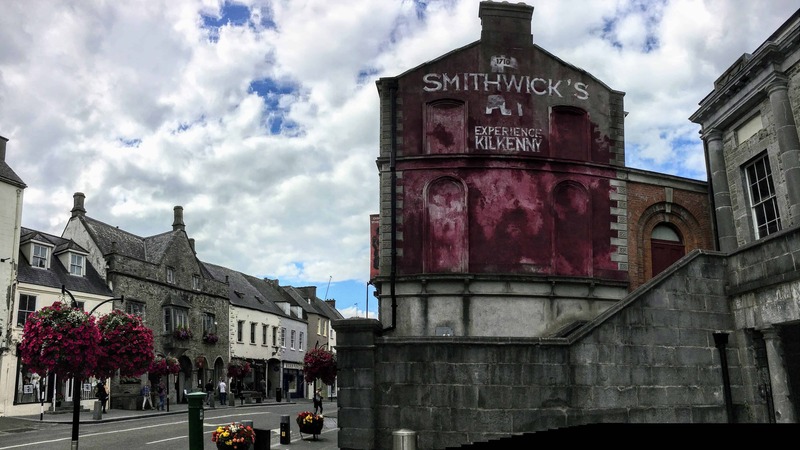 Visit the grounds of the Kilkenny Castle, wander down the Medieval Mile, and grab a pint at Smithwick’s brewery. 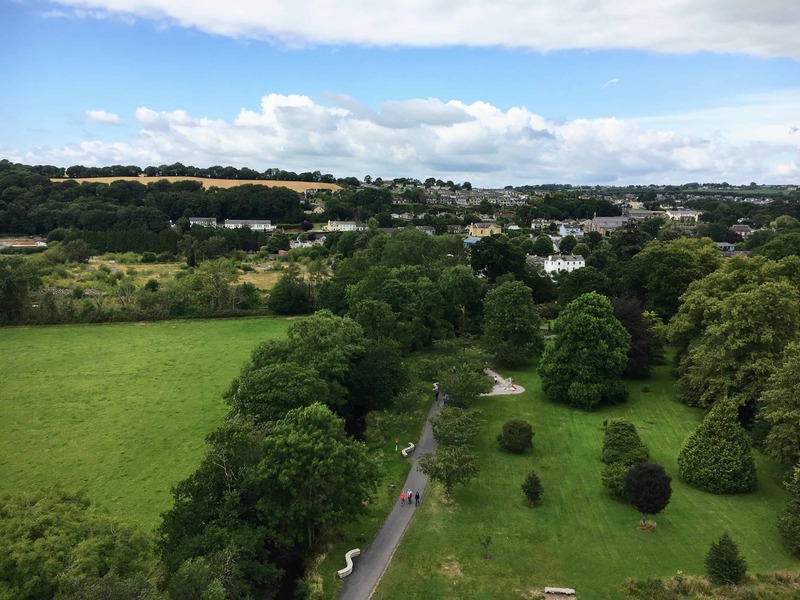 Follow in the footsteps of Winston Churchill and kiss the Blarney Stone at Blarney Castle, sample lots of delicious foods at the English Market, and admire the local architecture. 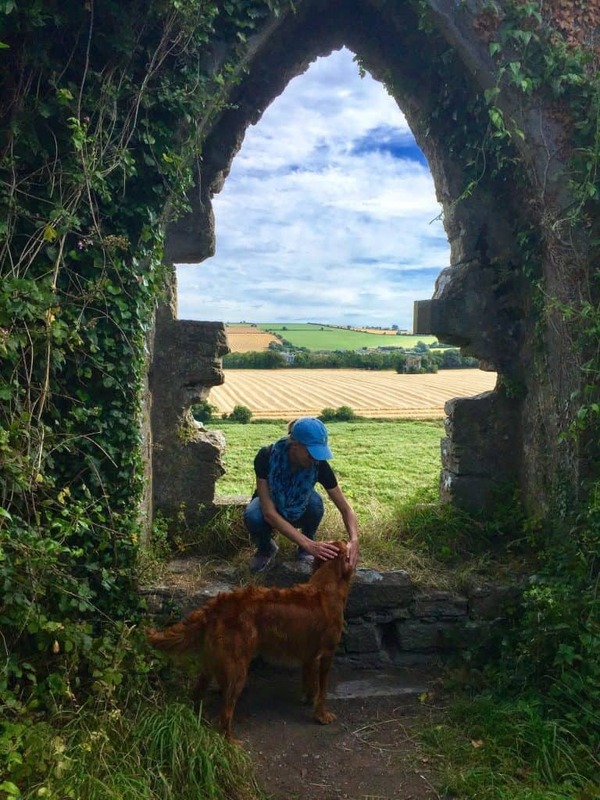 Check out the abandoned castles and abbeys along the winding country roads, stroll along the Kinsale harbor, and sit down for some Fish & Chips at Dino’s Family Restaurant…Yum! 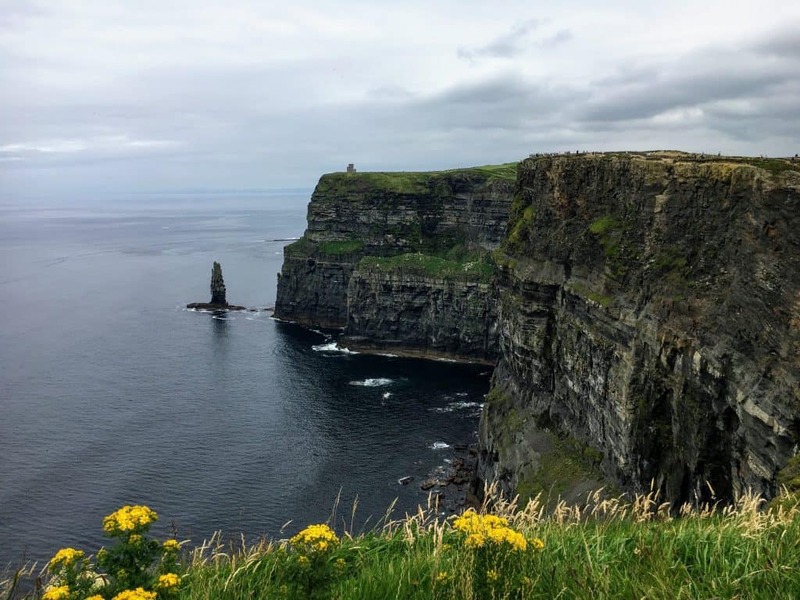 Depart early to beat the crowds that flock to the Cliffs of Moher to admire the stunning landscapes that make it Irelan’ds top natural tourist attraction. Navigate the buzzing side streets, check out the local artist markets, and listen to the many street performers. Eat a traditional Irish breakfast, stop by Trinity college, and people watch as you walk down the River Liffey. In Ireland and all of the U.K. you sit on the opposite side of the car AND drive on the opposite side of the road. That took me a few days to wrap my head around. I can still hear my family reciting “Hard left! Wide right!” every time I turned at an intersection. Although nerve-racking at first, I guarantee you’ll feel an indescribable sense of accomplishment when you master driving in a foreign country. To rent a car in Ireland you will need to provide a valid driver’s license, passport, and credit or debit card. Our total transportation costs were around $500 or $83 per day including the cost of gas and a 6-day car rental. After a quick comparison of rental car companies, we decided to go with Europcar because of its proximity to our hotel and low prices. Overall we received great customer service and a good-as-new rental. Two tips that could save you big money when renting a car in Ireland is the type of vehicle you choose and whether you purchase rental insurance. In Ireland and most countries in Europe, rental cars are almost exclusively manual. Learning to drive stick shift will save a lot of money. The associate helping with our rental told us that an automatic car would have cost us 2x the daily price of a manual one. It’s also common to pay an extra daily charge for adding drivers to the contract. Rental insurance is another added expense that you may not need. A little-known fact is that many U.S. credit card companies already provide rental car protection free of charge. I suggest researching online or calling your credit company to see if your card includes rental car insurance benefits. I personally use the Venture from Capital One because of its many international travel perks and low annual fee. 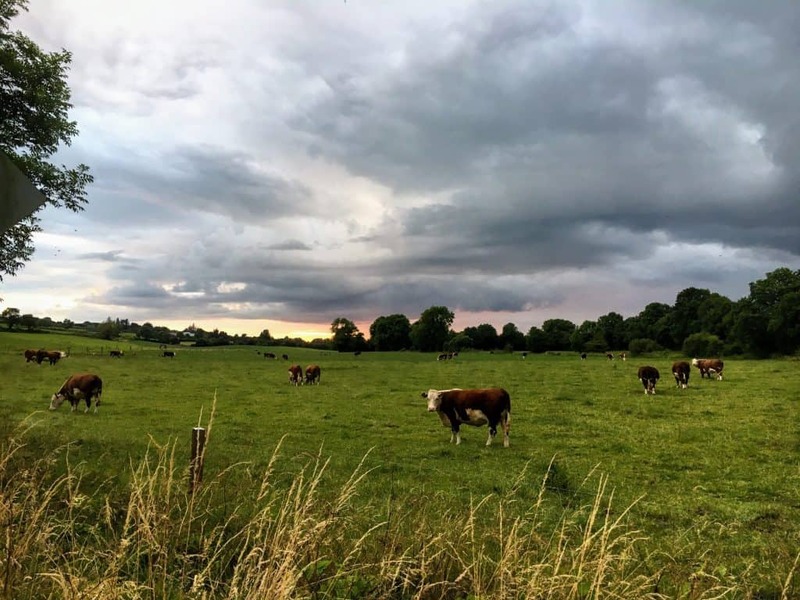 The high season for Ireland runs from June until September. The sun was shining for the majority of our trip in July but we still wore layers because of the unpredictable weather. 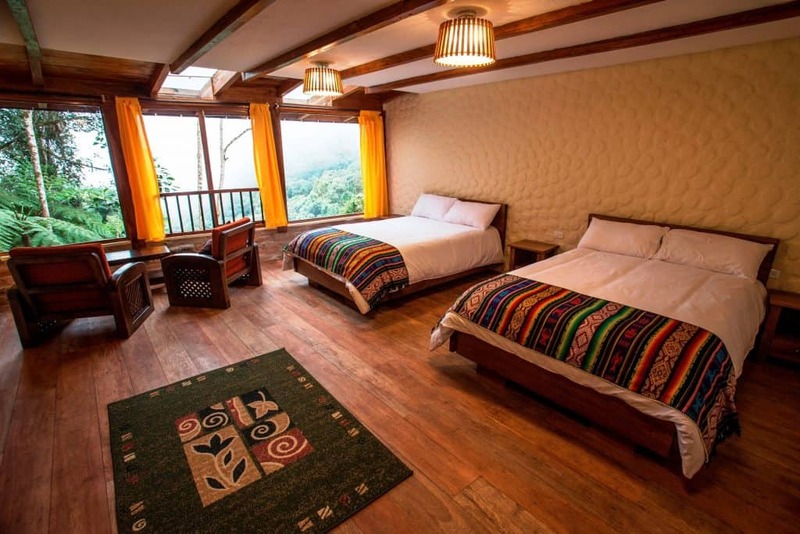 It was noticeably more difficult to find accommodations during the peak season and for the budget traveler, there may be some initial sticker shock when looking at hotel prices. 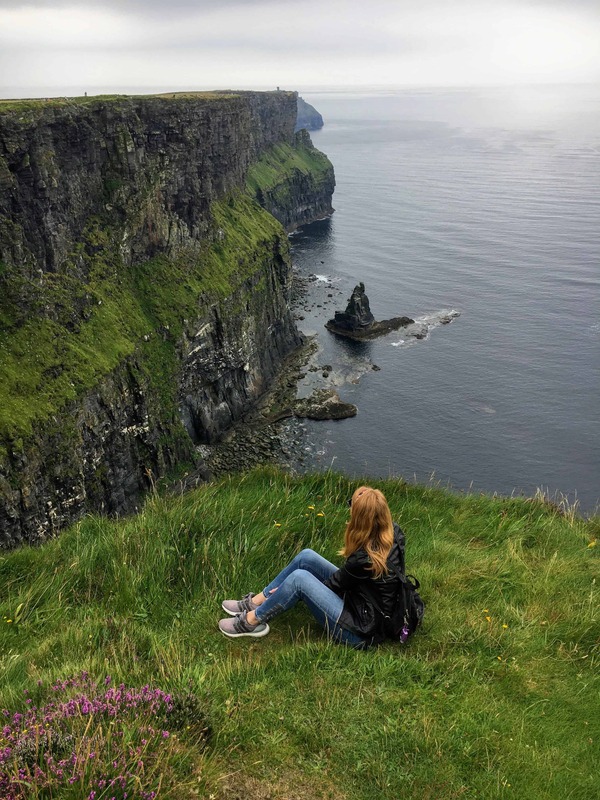 Although prices will be high when you get to Ireland, you can find super cheap $300 round trip flights to Dublin by searching Norwegian or WOW airlines. Truth be told, I hate planning in advance. Two months before our trip, I struggled to secure accommodations because nearly everything had already been booked. 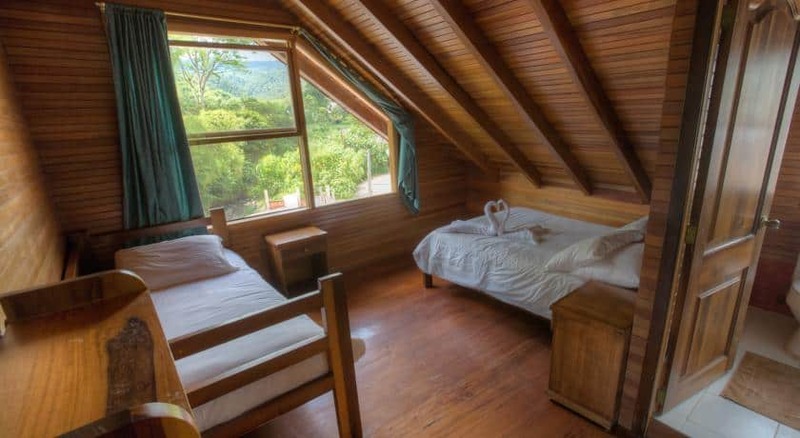 With a lot of searching, I still managed to find some last minute steals for around $120 a night for 3 people staying in either an Airbnb or Bed and Breakfast. Don’t wait until the last minute like I did. Plan your accommodations several months in advance and you will have a much easier time finding affordable lodging! 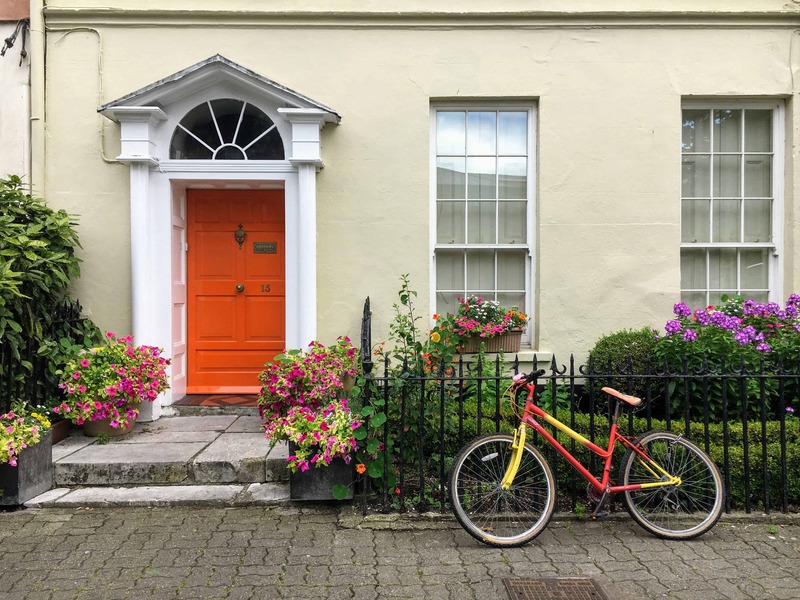 The most budget-friendly accommodation in Ireland is either a hostel, Airbnb, or Bed and Breakfast. Dublin was by far the most expensive city on our trip. 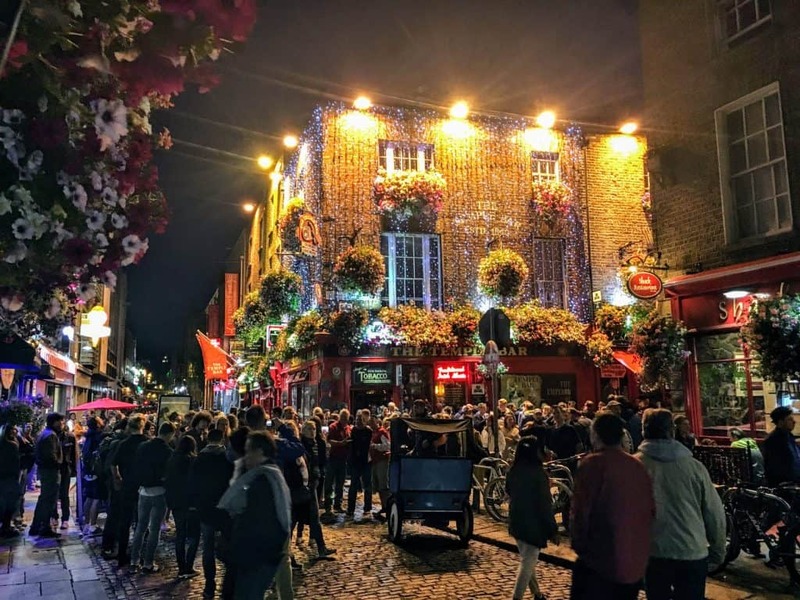 For Dublin, I recommend trying to book a place near downtown so you can be within walking distance of the many city attractions. If you are traveling during the summer months and are looking for a unique budget-friendly experience, stay at Trinity College. 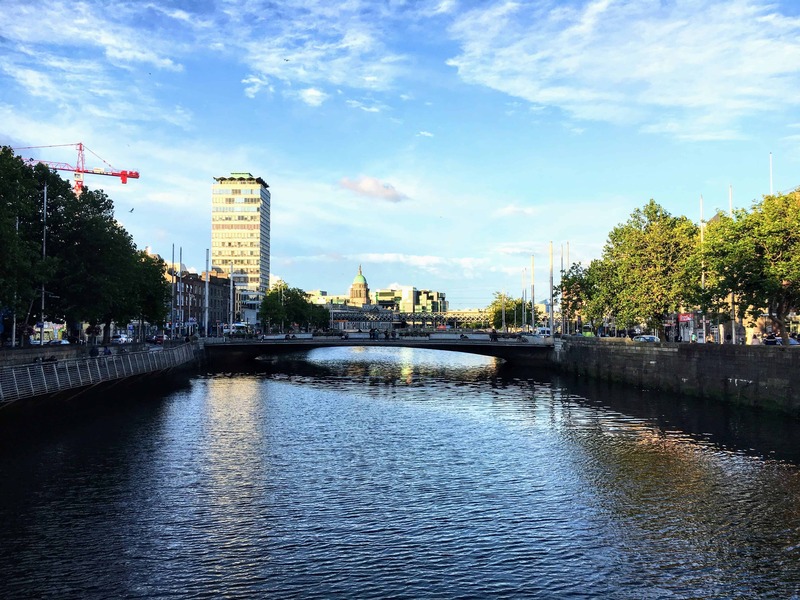 You will be in the heart of Dublin, the campus is iconic, and the prices are fair. As expected, it is much easier to find reasonable lodging prices in Cork and Galway. Don’t be afraid to stay a bit further out of the main downtown areas and book a place in the countryside. It’s generally a better value and more spacious – plus you’ll have easy parking access and get to experience the local way of life. On your journey around this magical country, you’ll see why Ireland is a bucket list destination! If you are doing your road trip right, you’ll get a little lost along the way. You don’t need to plan every detail of your trip. Our best days were the ones we didn’t plan. 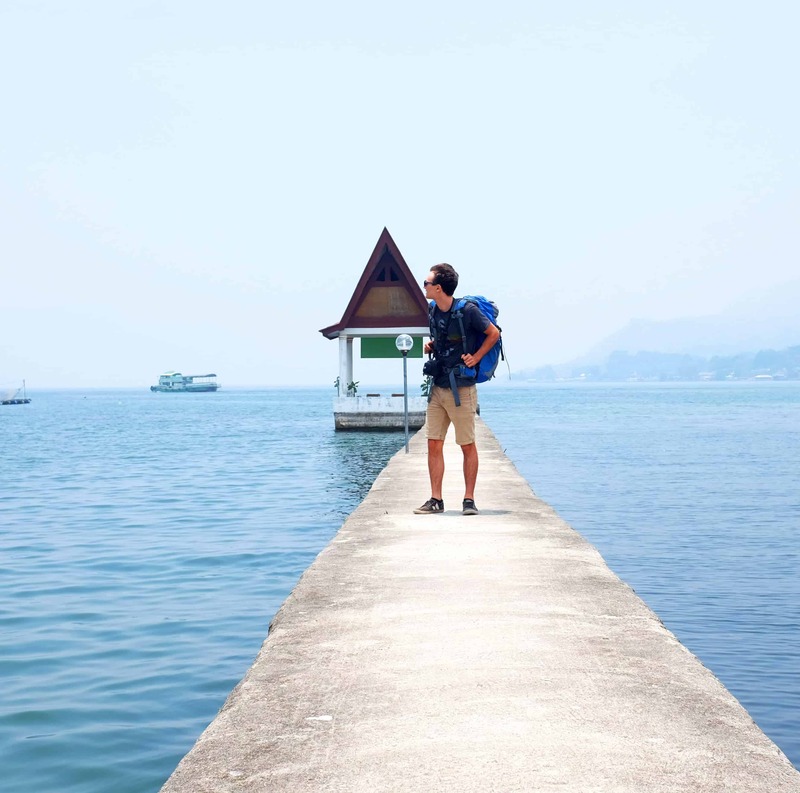 Other than accommodations and flights, make the trip an adventure and see where it takes you. Don’t be shy! Make sure to ask for tips from your hosts or other local acquaintances that cross your path. Irish people are friendly and like to have a good time. 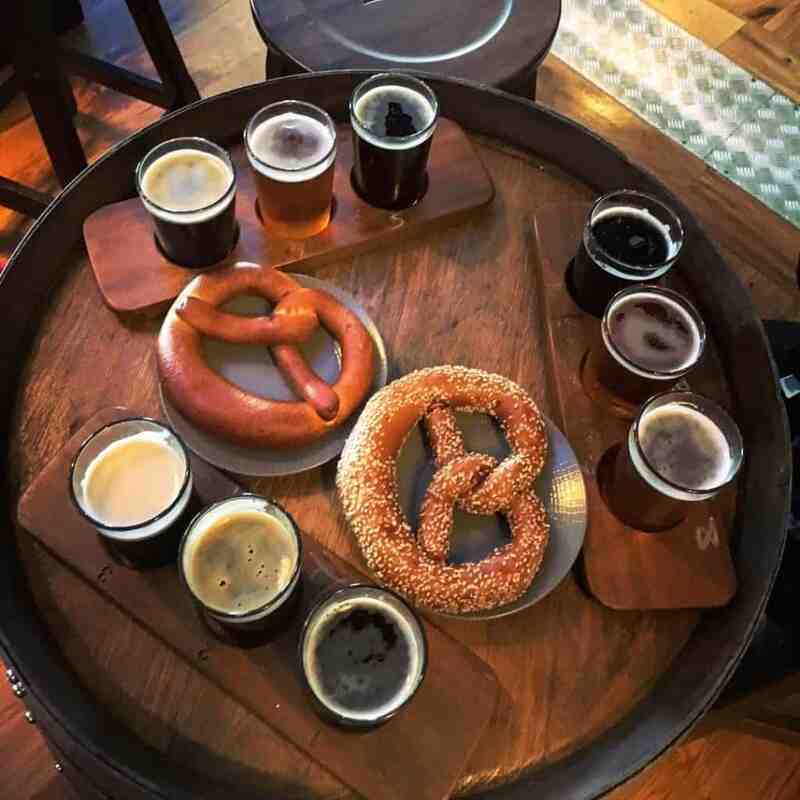 Strike up conversations with the locals and if they suggest you visit a hidden gem or restaurant in the neighborhood then there’s a 100% chance you should go check it out. Side note: when you do go out to eat, you can choose to tip servers 10% at a nice restaurant and it is not necessary to tip bartenders or taxi drivers. Except for the occasional nasty bits of weather that Ireland is infamous for, there isn’t much to complain about. Pack a raincoat and some extra warm layers or just drink lots of Guinness. Memorial day 2017 for most people meant burgers and brews in a close friends backyard. Memorial day for us was 8,000 miles away on the back of a motorcycle surrounded by clouds on top of a mountain. 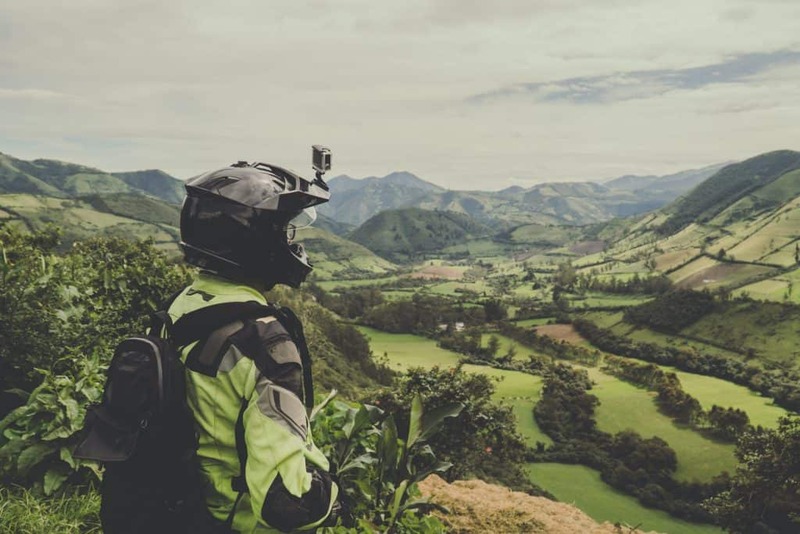 We heard that purring through the mountains of Ecuador on a bike was a bucket list item people take months or years to commit to – we signed up just a month before we left. Many people thought we were insane when we told them we were spending Memorial day on a motorcycle driving through the clouds atop a mountain in Ecuador. In the end, they were crazy for not coming with us! We did the Self-Guided Chocolate & Cloud Forest tour, and it was life changing! It sounded insane and dangerous, but it didn’t feel like it. That’s because Freedom Bike Rental provided us with all the tools, and resources we needed to have a fantastic trip. No trip like this is without risk, but Freedom minimized all the known risks to make us feel as safe as possible. The route is excellent, and all the stops are pre-populated into the GPS they provide you. The scenery is beautiful, and there are a ton of great stop off points. The roads are so much fun to drive on; around every winding turn and each beautiful overlook are backdrops any car commercial producer would die to get a shot of. As part of the self-guided tour, you get almost all the equipment you could need. From clothes to tech it’s all there. Below is a gear list. GPS – A nifty Zumo + Garmin GPS that charges while driving via the motorcycle. It comes preloaded with all the points of interest. Gloves – Standard motorcycle gloves. Helmet – Many helmet options that were are all high quality, and DOT approved. Several helmets also included GoPro mounts. Motorcycle Jacket – Great multi-layer motorcycle jacket. A jacket with multiple layers ensures you can match the elements without losing the protection from the body armor. Emergency Equipment – This included a replacement tube, air compressor, and a first aid kit. They have a 24-hour support line and a mobile mechanic, but they provide you the tools to do it yourself if desired. Lockable Cargo Boxes – Depending on the bike model, multiple removable and lockable cargo boxes. Bungee Cords – heavy duty bungee cords to tie down additional load. Video Camera – You can rent a GoPro or a Garmin VIRB HD camera for only $10/day. Communication Headsets – A Uclear communication headset to communicate with other riders for $5/day. For a full list of the optional add-ons and exact models check out their website. All in all, each add-on was very cheap for the value provided. For example, a GoPro costs hundred of dollars so having access to one for a few days at less than $50 is a bargain. The equipment is great, but the tour itself is excellent. In 24-hours we saw and experienced what the average person does in a few weeks. We obviously won’t cover every single one of the 17 stops that make up this tour. However, we picked out our favorites to provide a sufficient overview and story. The overlook is one of the first stops along the tour. Whether you are religious or not, it’s recommended to pray for a good ride here. When we found ourselves looking hundreds of feet down over a daunting ledge from a motorcycle, we became religious REAL QUICK. Anyways, the Virgin Del Camino Overlook is one of the best parts throughout the tour to grab photos, so have your camera ready. The waterfall hides in a scenic valley. The hike to get there is pleasant and eye catching. It’s no Victoria Falls, but it’s on the route and easy enough to get to which makes it worth your time. The waterfall is great, but the hike there rivals the beauty of the waterfall itself. The Cloud Forest where the Bellavista Nature Reserve sits is breathtaking. Driving into the fog on a dirt road in the mountains has a strong cinematic feeling. I half expected a bunch of orcs to come storming through the fog at any moment. At the Reserve, you can hike, learn a ton about the forest, and stay in one of their rooms that has a breathtaking view of the mountains. 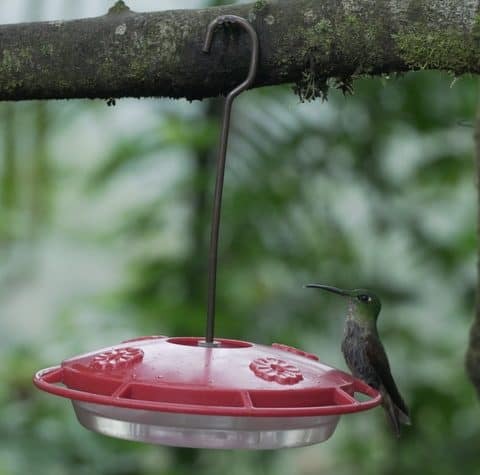 The Bellavista Cloud Forest Preserve has an incredibly knowledgeable owner and the operator by the name of Richard Parsons. He is an Englishman who is referred to by some as a walking BBC documentary. If he is around while you are there pick his brain as much as possible, as he is extremely knowledgeable about the cloud forest and travel in general. He built the Cloud Forest from the ground up. While we traversed through the cloud forest, we stumbled upon some spectacular views and this beautiful swing that went right over a massive drop down into a valley. It was a surreal experience, but it is not for the faint of heart. Taking a spill off the swing could have put a monkey wrench in our vacation experience. As they say though, no risk no reward. Mindo is a small town north of Quito, Ecuador that has a population of just a few thousand people. 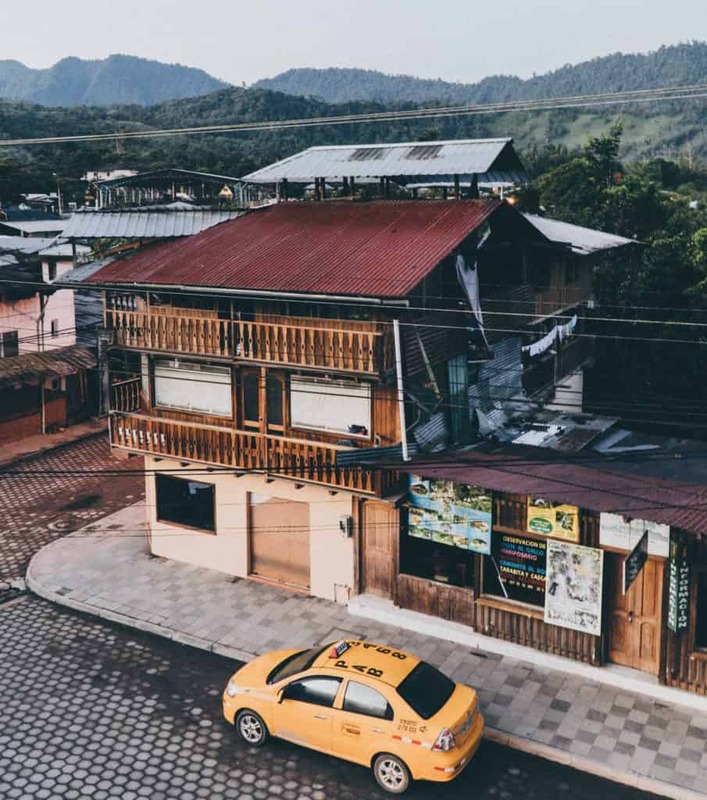 While the tour is self-guided and we could choose our pace, following Freedom Ecuador’s advice and staying a night in Mindo is the right move. For $15 we had an excellent steak with a Club Cerveza. If you want a night out, there is a small Karaoke bar called late night bar. They have drink specials and seem to be relatively accustomed to foreigners. We stayed at the Dragonfly Inn BnB for just $49 (Spring 2017) a night, and it was an excellent place. They provided secure/gated parking for our motorcycle and the manager even woke up at 5 am to give us our complimentary breakfast. 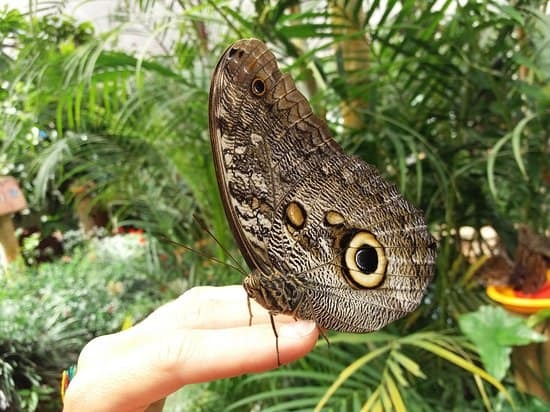 The Mariposas de Mindo Butterfly Garden in Mindo is a rare experience. It is a small café and garden where you can enter a netted area filled with over 1200 butterflies and moths. There is also a small restaurant and hotel here. If you are lucky, a butterfly might just land on your hand! 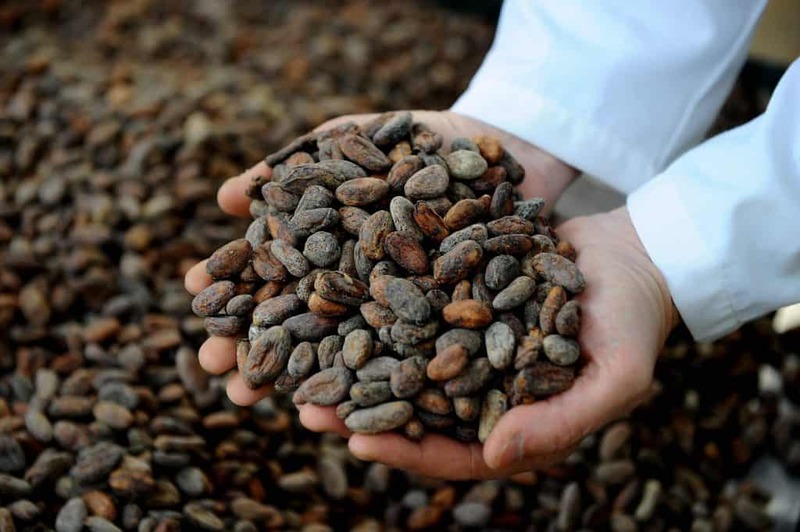 The El Quetzal Restaurant and Chocolate Factory is delicious and informative. We didn’t make it in time to see their detailed tour that shows the age-old process of making chocolate from bean to bar, but we enjoyed a delicious mocha coffee. The tours run all day 10am-5pm every day on the hour. The coffee and chocolate are incredible, as promised. 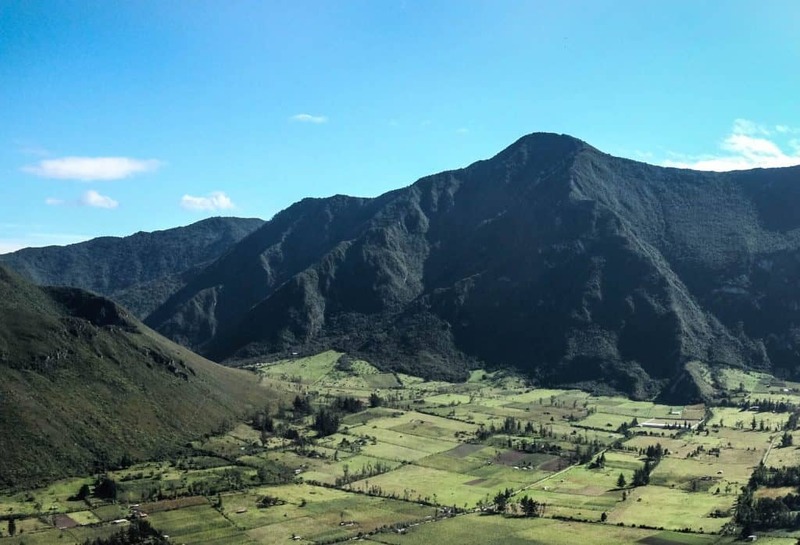 The Pululahua Crater is a dormant volcano that sits north of Quito. 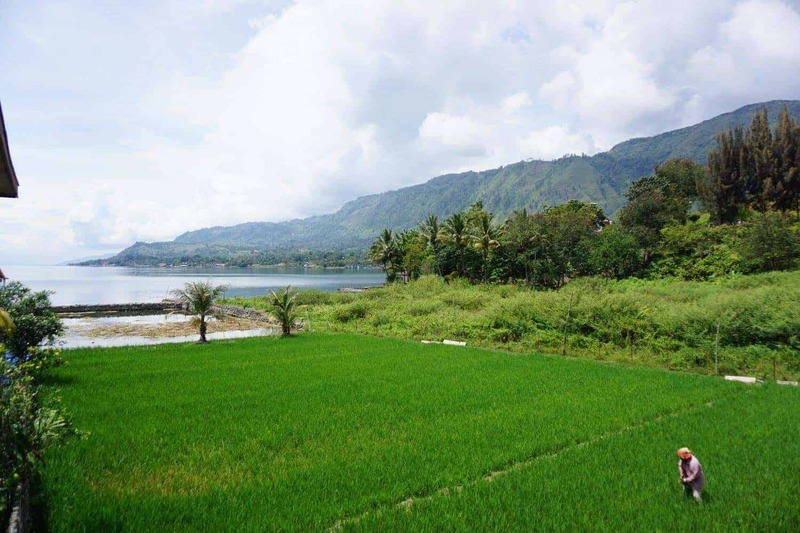 The Caldera is 5km wide and filled with beautiful greenery. If you have free time, you can even stop and do horseback riding in the bottom of the crater. The Crater was the best or second best part of the trip. We parked our motorcycle for free just in front of the small, unassuming entrance. Just around the corner is a beautiful lush green crater that has a small town right in the middle of it. 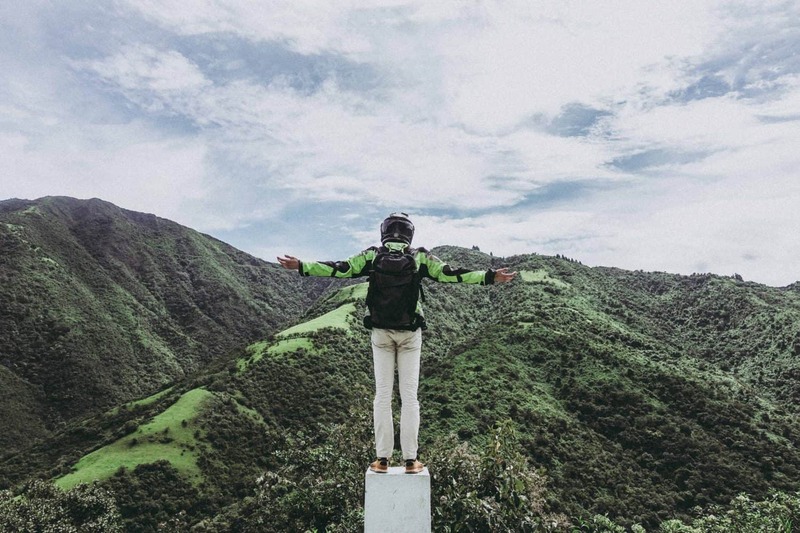 A fantastic view seemingly tucked away like this is quintessential Ecuador. At every turn, you are surprised with a view so spectacular it seems to rival the one you saw just moments ago. 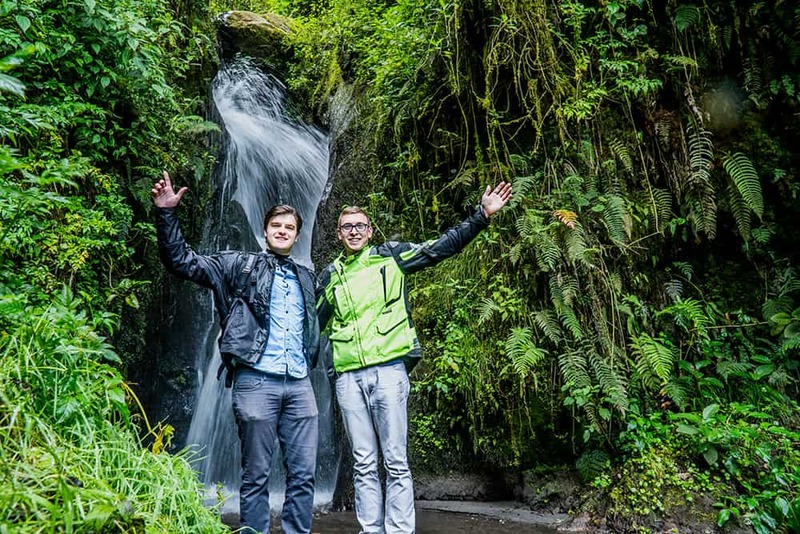 The Freedom Bike Rental Self-guided Chocolate & Cloud Forest Tour is a once in a lifetime experience. The Freedom Bike Rental company is well organized and kind. The whole process exceeded our expectations! It was risky, but in the end, the only time we almost laid the bike down was when a few tiny dogs chased us – they felt bigger in the moment :). 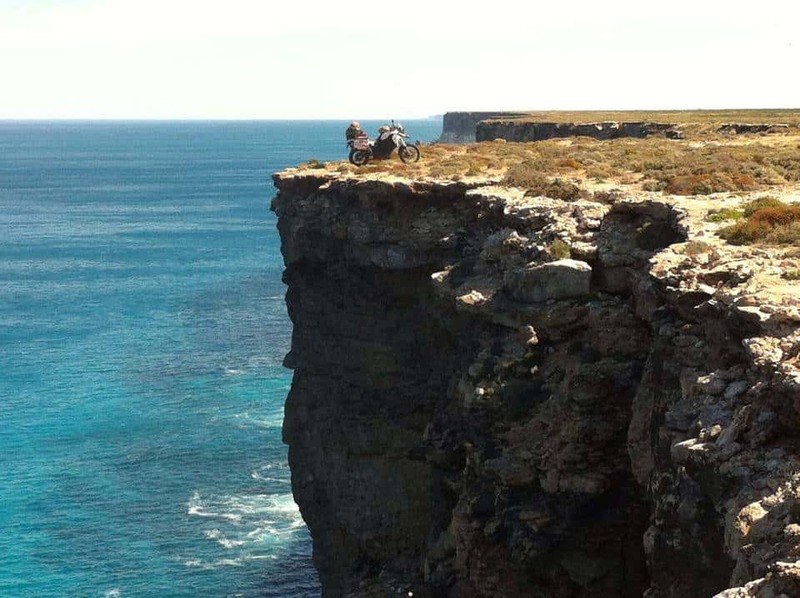 If you are on the edge of taking up a daring adventure – just go! Walking around Los Angeles at night or driving through rush hour traffic can be more dangerous than a motorcycle tour through Ecuador. We can’t wait to go back to Ecuador and rip through the mountains, but this time we want to make it all the way to the beach! If you are unsure take a peek at the video below that pushed me over the edge and convinced me that I absolutely had to go! Note: All views expressed are our own and we were NOT compensated by Ecuador Freedom Bike Rental. All Images are taken by Life Nomading unless otherwise stated. Comments questions or concerns tweet us @lifenomading. We woke up early in the morning after a long night of singing and drinking. We had a bit of a hangover and a lot of excitement. It was an amazing experience so far, but we we’re less than a full day into our 4 night stay on the Island of Tuk Tuk. Himbit kinda just showed up at our villa (didn’t even need to call him) and gave us a ride back to his house to pickup some scooters we we’re renting from him. We grabbed the phone number of his friends from last night, and a barbecue was on the books for the next day. Grab the scooters and hit the road. Around the island, up the mountain, down a hill, and through the farmlands we went. Away from the tourist villas and over to the other side of the island. Kids were walking home from school. Oxen were plowing fields. It was so different, but familiar at the same time. Parallels were everywhere. 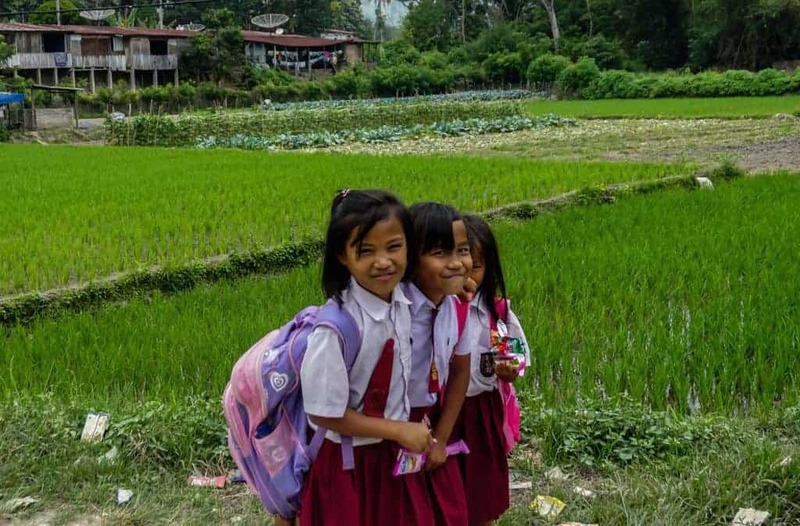 Kids walking home from school in North Sumatra. Life here is more simple. There is no rushing of cars, people aren’t walking around half cocked, and everyone is easygoing. In the fast paced and connected world we live in these days life can be hypercritical. We feel so busy. We feel overwhelmed. It’s all analyzed under a microscope over social media, through data, everyone is hypersensitive. Biking around Indonesia we stumbled upon some construction; It’s a family affair. At 23 years old I finally learned that abundance had nothing to do with wealth, or the minutia that occupied my daily worries. Passion, family, music, and relationships filled the people of Tuk Tuk to the brim. About halfway up the mountain in the middle of the lake, we figure out why no one is here. 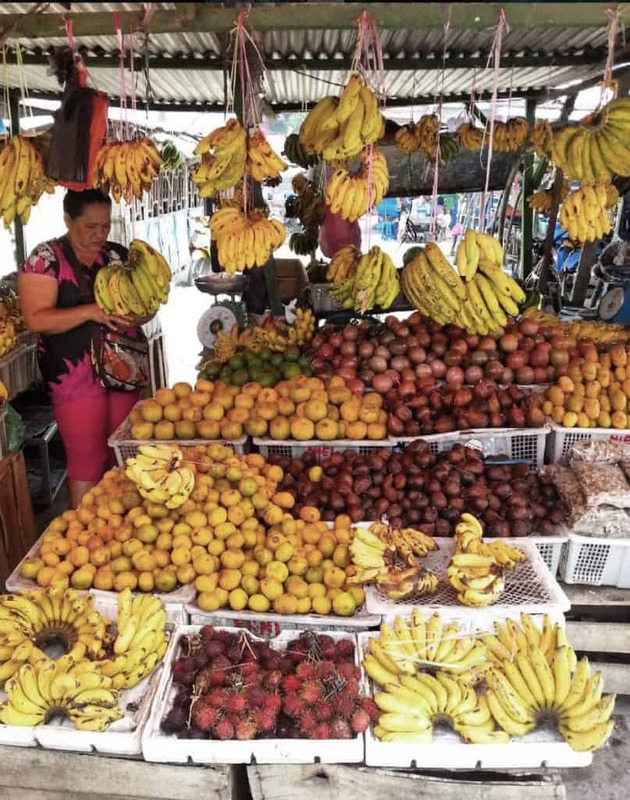 It’s rainy season, and a torrential downpour is on the way. We snapped this photo just before we headed inside a shanty on the edge of the road. The shanty was a coffee shop on the top of the mountain. It looked like a rigged up store that someone might have in their garage. 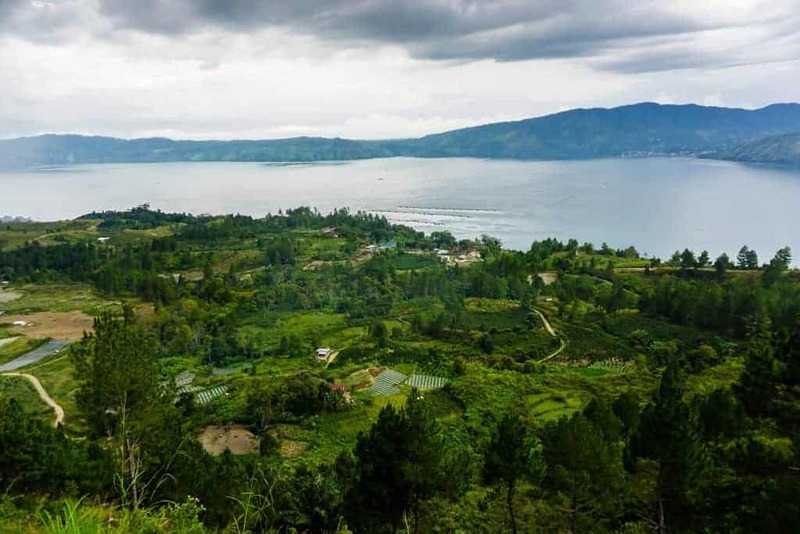 It sat on the side of a cliff, and every few minutes I glanced around to make sure the building wasn’t starting to turn into a disintegrating toboggan.We grabbed coffee, and like one does at Lake Toba, played the guitar. Literally every business on the island of Tuk Tuk must have a guitar. The building inspector must check that their is a guitar; it’s a requirement to open your business. We waited for over an hour and the storm didn’t wain for a moment. It was time to face the rain. Two hours up the mountain was still two hours down. There was no rain gear. We drove right through it and nearly froze to death. After getting back to then villa I raced to a hot shower. We looked forward to the barbecue, and the warm day that would hopefully await us tomorrow. Find out what happens next in Part 5. It was late at night, and the Moon’s reflection shimmered across the serene Lake Toba. We heard the voice of 4 men singing in harmony echoing off the lake. I instantly knew what we were doing next. I looked over at my travel partner, Harrison, and said “Let’s go. 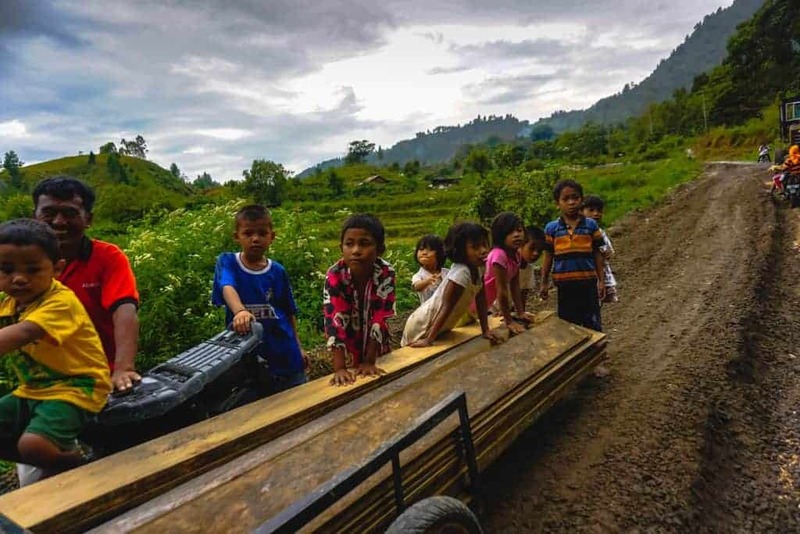 We are finding the music.” Music had been all around us since day one at Lake Toba. I knew it was important to their culture by its presence everywhere we went. This was our chance to dig deeper. We started walking down the single road that ran the circumference of the island. It was dark as ever, the light from our mobile showed the path, but our ears guided us to the music. We came upon a group of musicians singing, jamming, and drinking the night away. We were welcomed immediately, offered a seat, and a drink as well. They were drinking something that almost looked like milk, and now we were too. 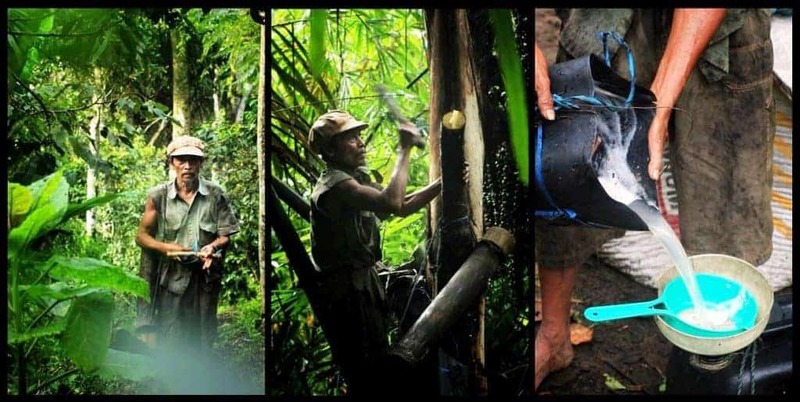 It was “Tuak.” A type of palm wine made from tapping the sap from a palm tree into a jug for fermentation. We started chugging down some strange palm wine, while we sang harmonies with the locals. The songs themselves were all about the lake. We sang “Danau Toba! 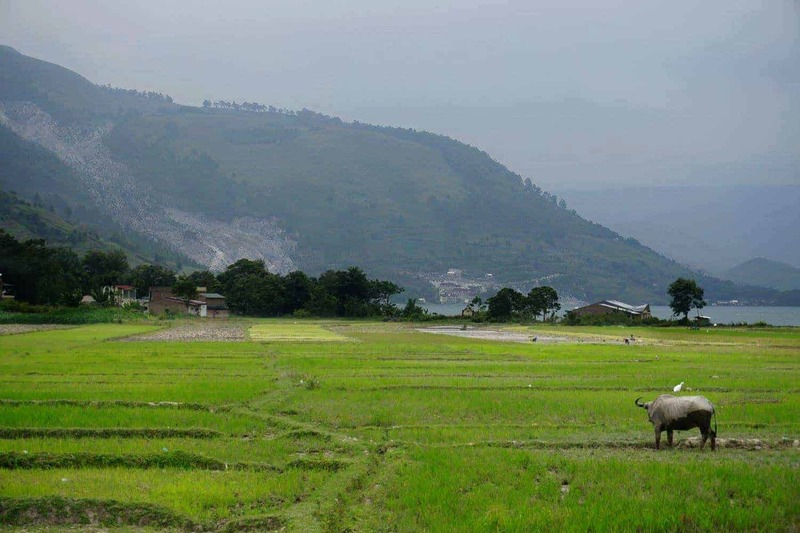 !” which was the little we knew in Indonesia….It means Lake Toba. *Palm wine can be dangerous if made incorrectly. The methanol can cause blindness. Trust who you drink it from. It was an amazing experience. To visit another country and be welcomed into their element. Not only as an observer, but as a participant. The lake was their livelihood, they all made their living from it in some way. It is no surprise that the songs paid homage to the lake. After we sang, we got to talking and of course someone knew Himbit. It turns out Himbit’s brother was there. We quickly made friends, and started talking about future plans together. 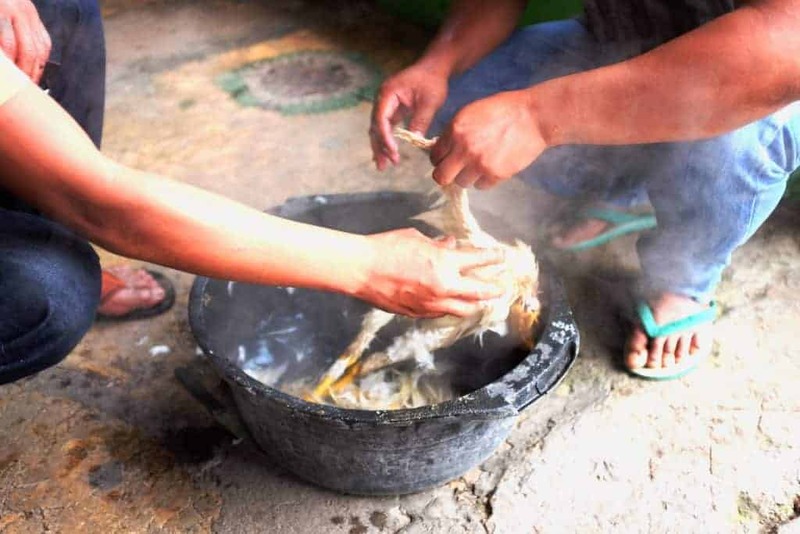 Someone asked us “Have you ever killed a chicken?” Being raised in suburban Ohio, our answer was an obvious no. To be honest, I hadn’t killed anything more than a bug. I didn’t really understand. Our new friend asked us to come over for a barbecue. He insisted we capture and kill the chicken ourselves. 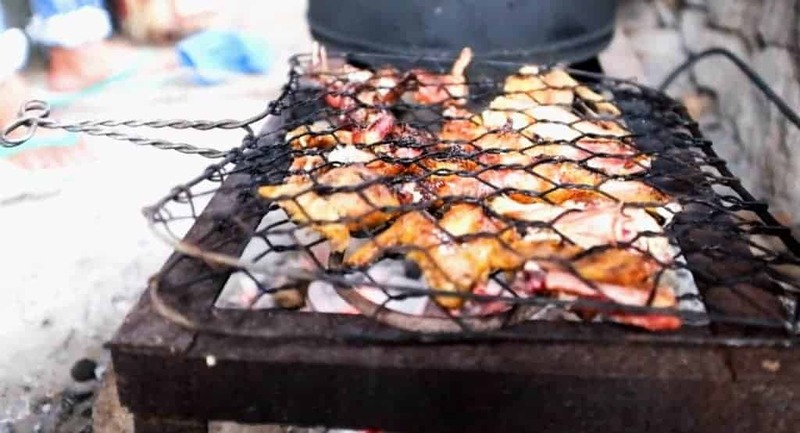 I have eaten chicken in my life hundreds, maybe thousands of times, but it has never been the same since this. Find out what happens next in the series in part 4. We woke up at 8 to catch the 9am ferry. Everyone was up so early; the market was in full swing. What had been dark and deserted the night before now was filled with vibrant colours and shouting. We were playing a guitar out front and eating some fried rice for breakfast. We caught the attention of a guide, and musician, Himbit. He joined in on our jam and we began singing some nonsensical melody. Nothing in Indonesia seems to leave on a consistent schedule. Before we realized it , the 9am ferry left at 8:55. Himbit said “I saw it was about to leave but I didn’t want to interrupt the awesome jam!” It felt like we would never get to Tuk Tuk, and we really wished our jam would have been a little less “awesome” so Himbit would have told us the boat was leaving. 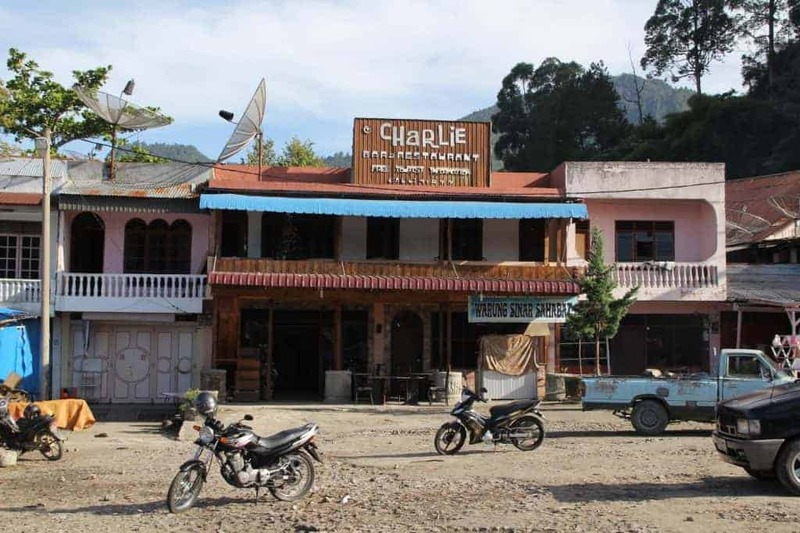 A half a day on the plane, 7 hours in a car, and a night in the grimy, yet character filled, Charlie Inn had still left us one boat ride short. We caught the next ferry, and Himbit went over with us. We were apprehensive. Did he want to befriend us or take advantage of us – what was in it for him. The cottage was finally before us. We jumped off the dock. Finally. Paradise. A fisherman lifts his net just off the boat dock on Parapat. 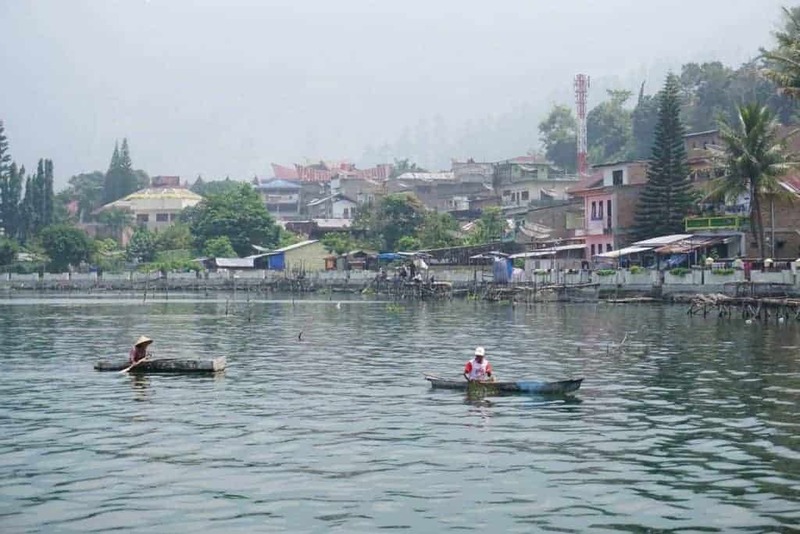 Small Batak houses, lush greenery, and palm trees lined the translucent blue lake. We grabbed food at the restaurant and talked with the Dutchman who owned the estate. After some swimming, the night finally winded down. We looked on the lake as the moon’s reflection shimmered on the water. I convinced Harrison that we would spend our night following the music, and see where it lead us. Music found it’s way into everything at Tuk Tuk, and we were about to learn first hand. Find out what happens in Part 3: Adventures in Sumatra. “Taxi you need taxi?” said the stranger outside the terminal. My travel partner, Harrison, and I had just touched down in North Sumatra. 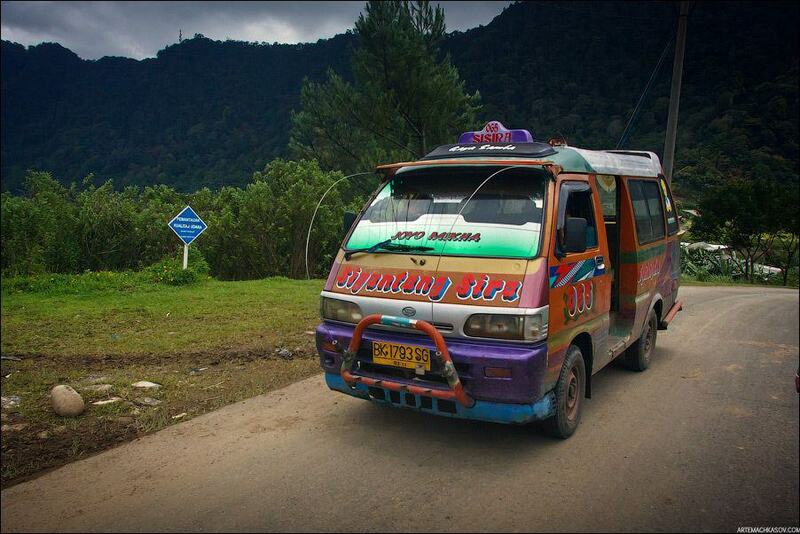 I said “We need a ride to Tuktuk.” We were heading to the world’s largest volcanic lake – Lake Toba. It sits on the worlds largest super volcano, last time it erupted there was a nuclear winter, and the massive hole was filled with water. Harrison and I looked at the man and traded the look of affirmation. 1 hour later two white boys from Ohio, a 90 year old Indonesian woman, and a native from TukTuk packed into a tiny van for a four hour journey through rural Indonesia. The two lane road was being exercised as four, but sometimes five when a bold driver would make a furious pass. The old woman had fallen asleep on Harrison’s shoulder. He gave me a look that said “Is she going to make it?” I pointed ahead as we veered back onto the right side of the road with the notion that we all might die anyways. A spitting image of our taxi. All of the vans were decorated vibrantly with paint, stickers, and decals of all colors. After a few near death head on collisions we finally made it to Lake Toba. We we’re planning on staying on the small island in the middle of the lake, Tuk Tuk. The last ferry had just left and we were trapped on the other side in Parapat. We wandered into a tattered guest house called Charlie guest house. The place was empty except for one middle aged woman. She gestured a spliff in our direction and said “Smoke?” She was playing bejeweled on a computer from the 90’s. Guitars were mounted all over the walls. 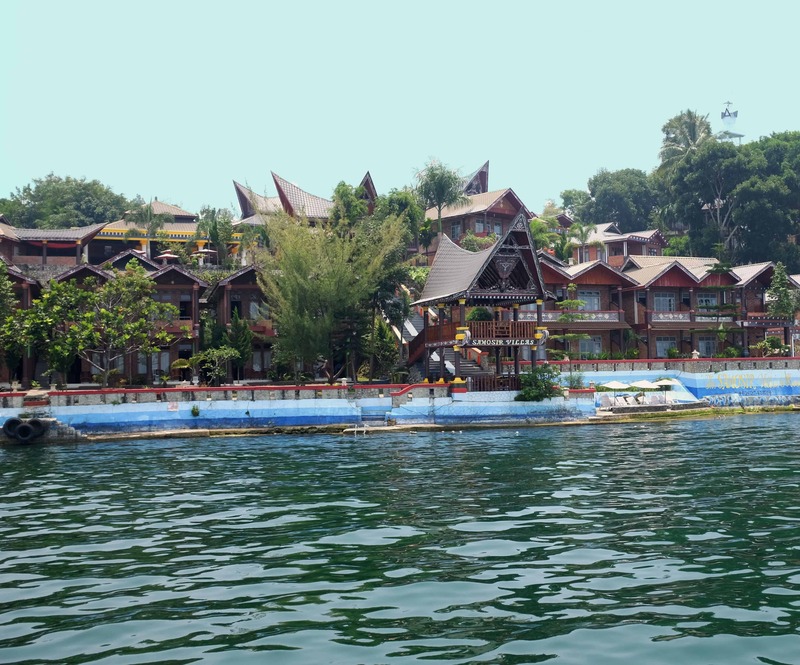 This was our first clue to the fact that music was ingrained in the culture of Lake Toba. 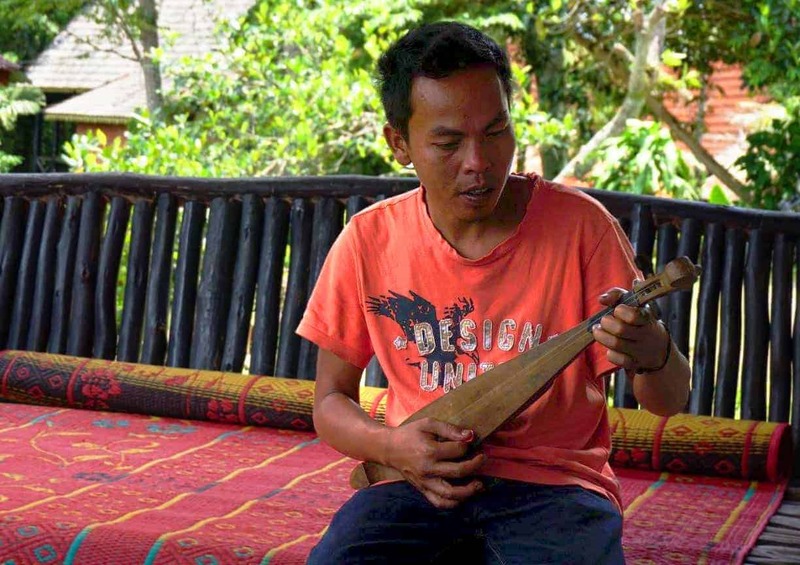 It turns out the guest house is owned by a famous Batak musician, who has played all over the world. Not one day passed where we didn’t play a guitar somewhere, with anyone and everyone, a jam could happen at any moment. Every place of business had a guitar somewhere on the wall that you were welcome to pick up and start playing. In just a few hours we would meet a good friend, Himbit, who would end up showing us all around the island of Tuk Tuk. We had no idea what we were getting into – The story continues in part 2. 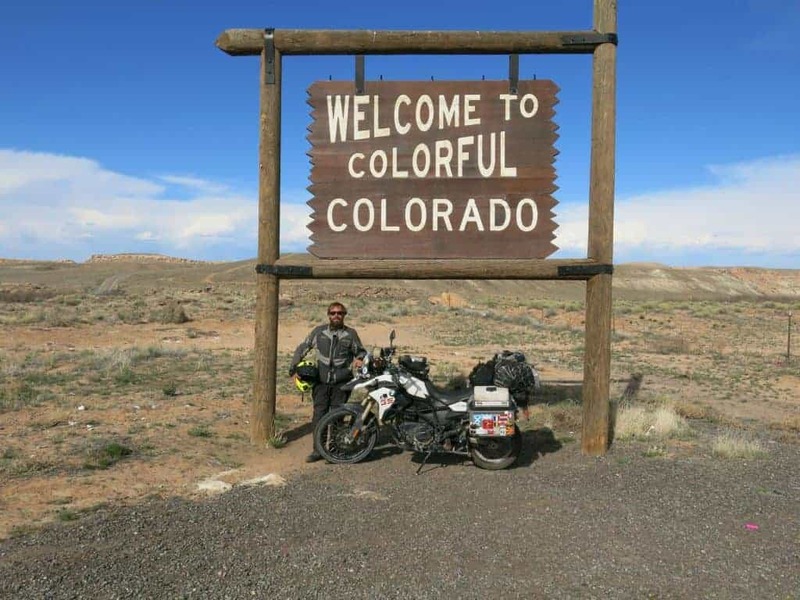 On July 5th, 2013 Patrick Harris left his home in Denver, Colorado heading east on a motorcycle; 636 days later he rode in from the west. 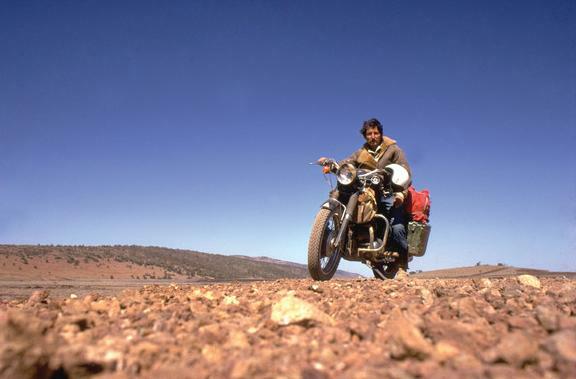 He had just finished riding his motorcycle around the entire world stopping in over 25 countries. 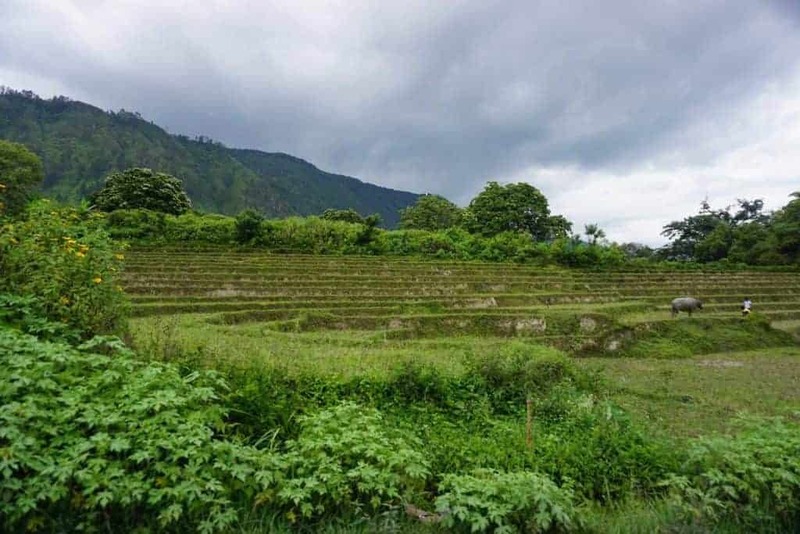 From the canals of Amsterdam, to the grassy hills of rural Indonesia, and the aborigine tribes in Australia – almost no stone went unturned. An adventure like this doesn’t end without lessons learned, countless challenges, and the story of a lifetime. 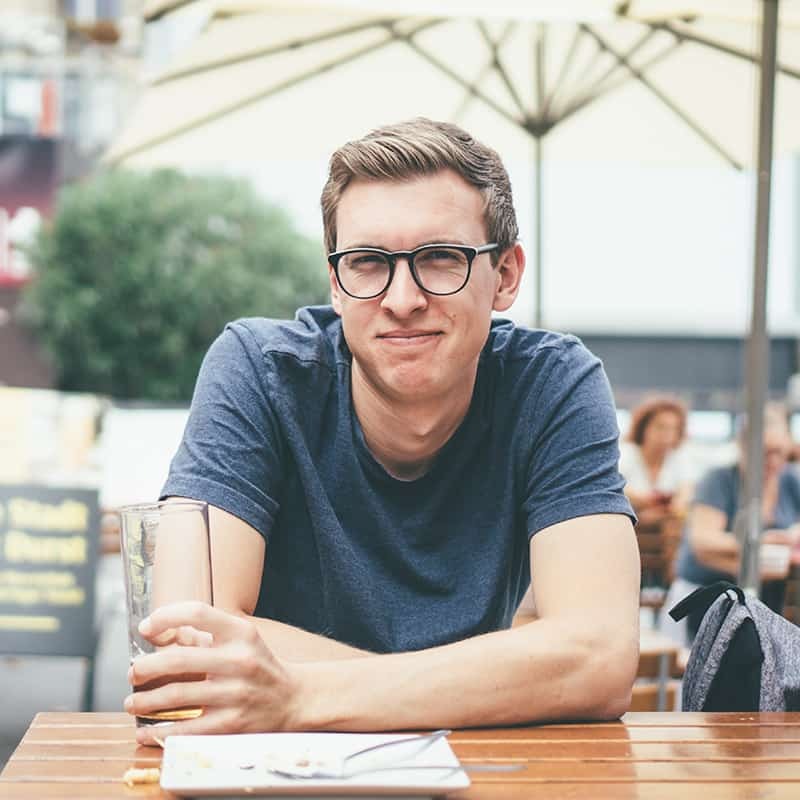 I sat down with Patrick to learn as much as I could about his journey around the world. Patrick’s route around the world. Click image for interactive map. 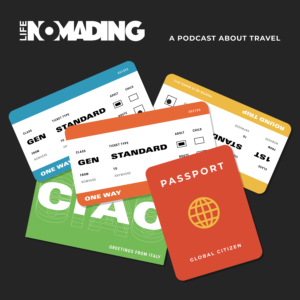 Life Nomading: How long did it take you to plan the trip? Patrick Harris: The allotted time spent planning was a month. However, you need to start planning months ahead for visas and other paperwork. I had a few destinations I knew I wanted to get to, and it took a minimal amount of research to see how feasible various routes were. I planned the specifics on the road, based on my own research, or the advice of locals or other travelers. There was some light research on visa and carnet. A carnet is basically a passport for the bike, to make sure that it enters and exits the country with you. I only left with a very rough route, and not too many specific destinations or plans. I planned the specifics on the road, based on my own research, or the advice of locals or other travelers. LN: What was your inspiration for the trip? PH: My main inspiration was the book Jupiter’s Travels Full Disclosure: We earn a commission if you click this link and make a purchase, at no additional cost to you. by Ted Simon. 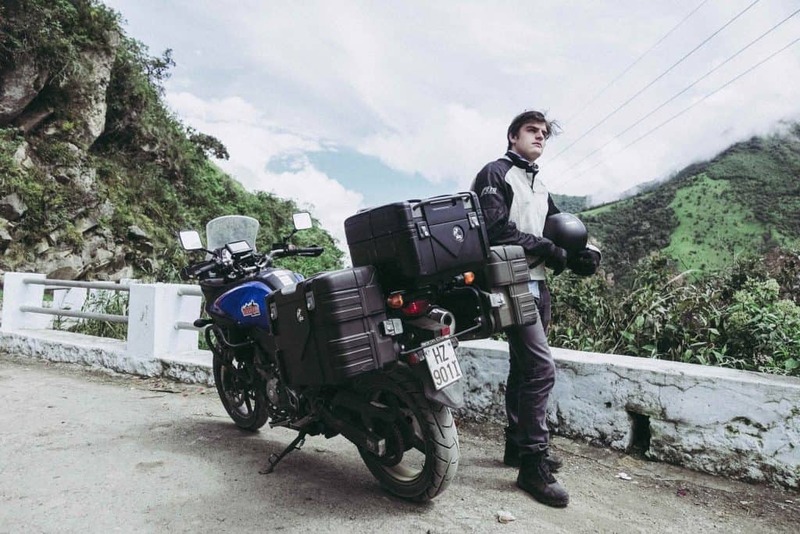 It tells the story of his four-year journey through 126,000 km across 45 countries. I can’t recommend Jupiter’s Travels enough, or his other books Dreaming of Jupiter, and Riding High. Question: What were some of your considerations before the trip? How did you mentally prepare? PH: The stuff I spent time on were the things that were in my control. I researched route possibilities, visas, border crossings. I studied up and practiced on the motorcycle maintenance aspect. As far as mental preparation, I basically just looked at the risks – breakdowns, sickness, injury, theft, etc. and decided that they were worth taking. 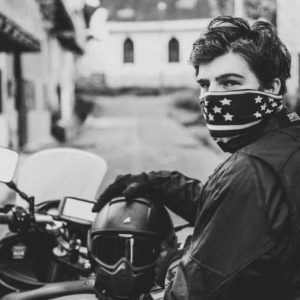 LN: What type of Motorcycle did you use and why? 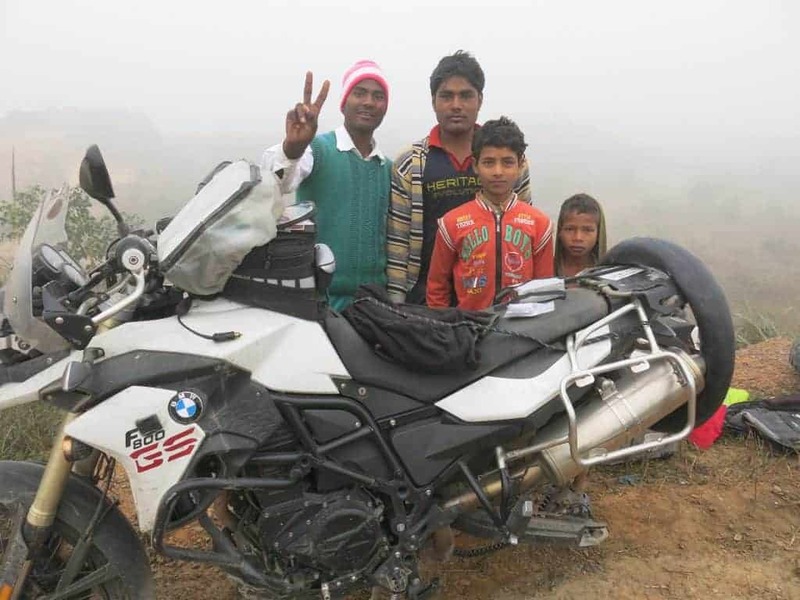 PH: I rode a 2013 BMW F800GS. 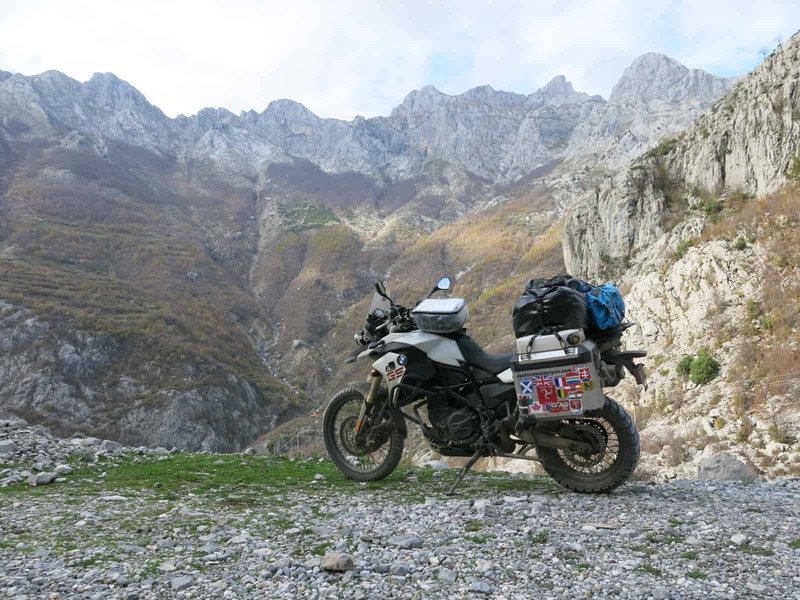 Depending on who you ask, you’ll either be told that a BMW GS is the perfect bike for the job, or you’ll be told you should’ve picked a KTM/Kawasaki/etc. In my opinion, the bike performed great…I still have it, and I still love it. But at the same time, you won’t find me talking down about other bikes. Ride what you find practical and comfortable. Ride what you like. Ride what you already have. Ride what’s affordable. Just go ride something. LN: Regarding your emotions: highest point? Lowest point? Did you come close to quitting? PH: I can’t really think of specific highs and lows (there weren’t any huge peaks or valleys, mostly, the whole trip was one big plateau). The localized highs happened when I met and got to spend a few days with really great people (locals, or other travelers), and the lows happened when I had to part ways with those people. 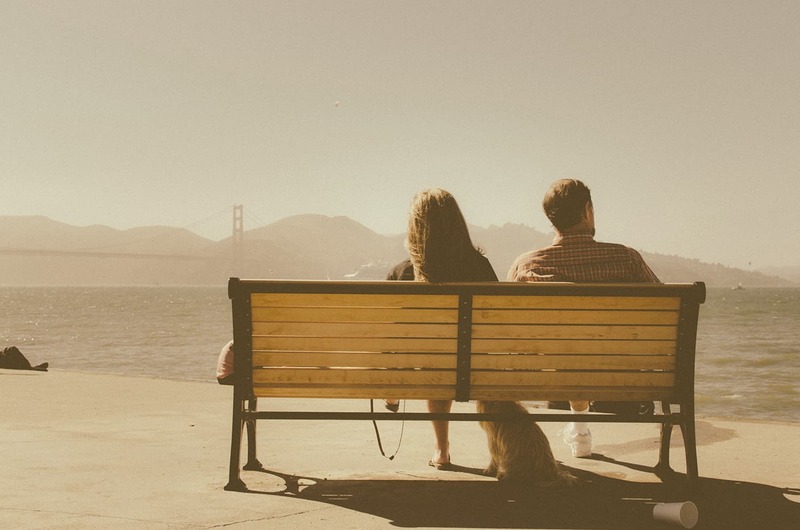 It’s kind of sad to think of the great short-term relationships I had with people, most of whom I’ll never see again. I’m thrilled that at least I got to experience a few days with them. Making friends in India while changing a tire. LN: What was the most surprising aspect of a foreign culture you observed/experienced? PH: India. Having lived my whole life in the US, India was the farthest from what I has previously experienced. Varanasi specifically was the most shocking to me. It’s an incredibly sacred city, and it was the most I had ever been exposed to a religion in that way. In Varanasi, religion is in the background of everything going on, to such an extent that saying it’s in the background is a bit of an understatement. LN: Where was your favorite place to drive? PH: For me it was northern Thailand. The roads were winding and picturesque. While there was chaotic driving there at times, it was the right level of lawlessness in my opinion. 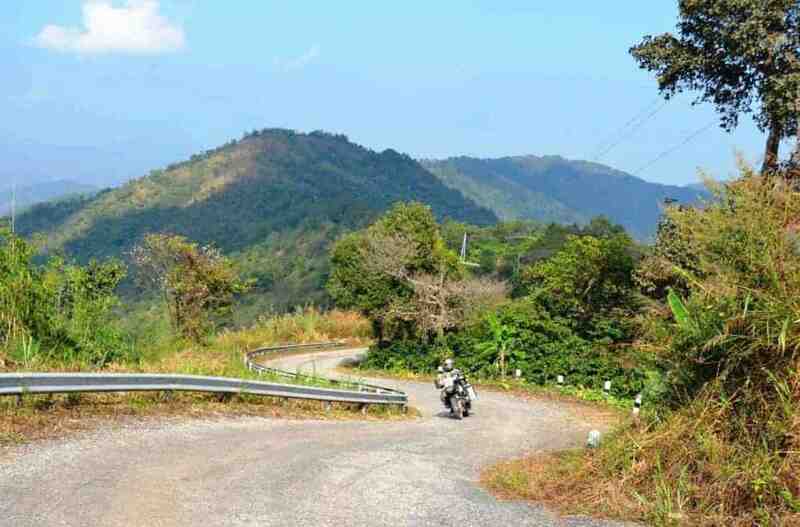 I still find myself day dreaming about driving through the roads in Thailand to this day! LN: Was there ever a time you felt in danger? PH: I was most nervous was when a kid on a bike ran into me in Indonesia. He flew off his bike. I didn’t have any serious injuries. I stuck around to make sure he was OK, and some people crowded around me. If it had got dicey, I would’ve left the scene, which is typically what foreigners are told to do when there’s an accident in a third world country, as things can sometimes get violent quickly and unexpectedly. LN: How were the customs (immigration checkpoint; not culture) at Thailand, Malaysia and Singapore? Was it confusing to switch from driving on the left to the right? 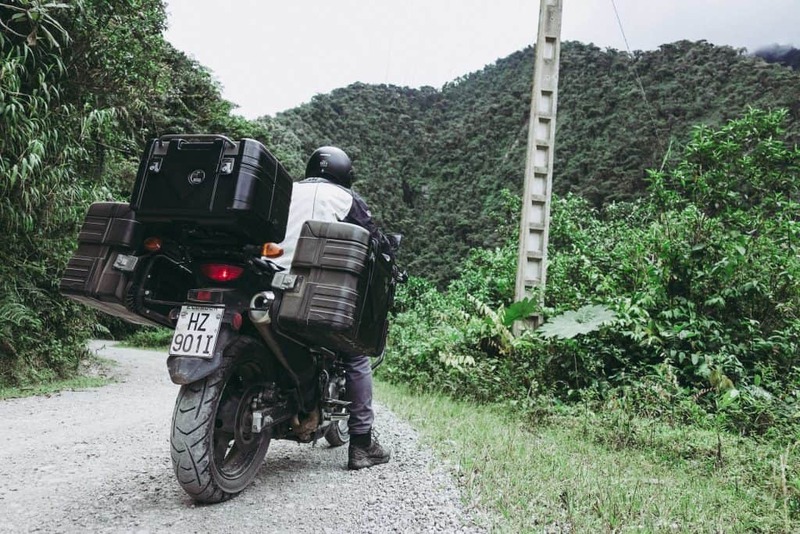 PH: Customs were always pretty uneventful, except for getting my bike into India…that was a huge hassle The only time I ever paid a bribe was $2 to get out of Laos. Crossing between Thailand a Malaysia was easy as can be…got my passport and carnet (paperwork for the bike) stamped it and out and was on my way. It was actually a lot faster than crossing from Canada into the US. As far as Singapore, I didn’t bring my bike in. It sounds like that’s a huge mess of paperwork and running around, so I opted to not bring the bike with, considering that I’d do all that paperwork just ride around the city for a few days. I had a couple close calls throughout SE Asia, but they were really manageable after being in India. Close calls in India became a daily occurrence. LN: What was your least favorite place to ride through? Any particular location make you think “I’m going to die”? 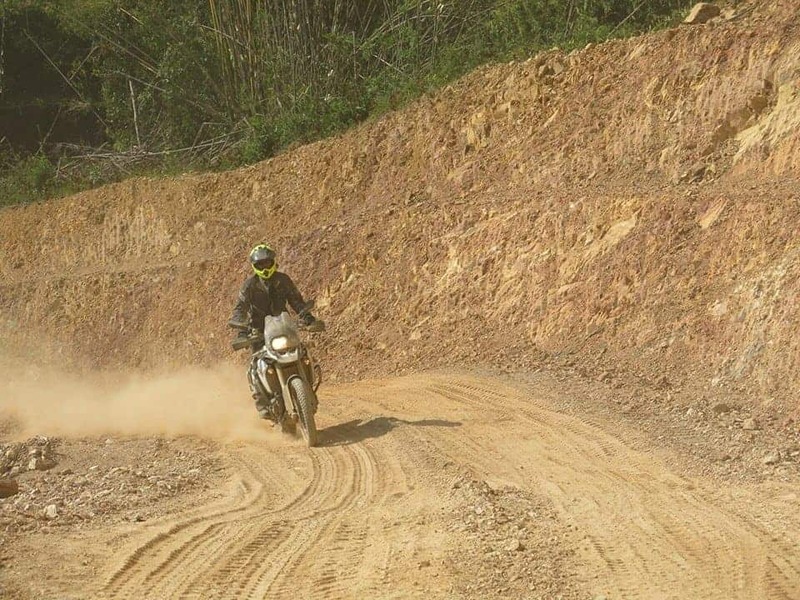 PH: The riding in India got fairly stressful by the end, and road conditions were rough at times. I loved most everything else about India, though. I had a couple close calls throughout SE Asia, but they were really manageable after being in India. Close calls in India became a daily occurrence. 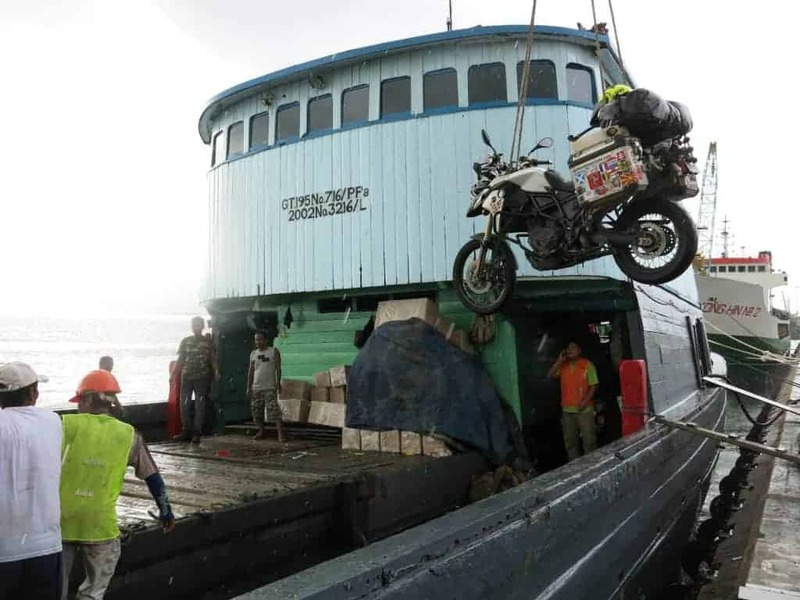 Lifting the bike onto a boat in Indonesia. LN: How did you finance a 2 year trip? PH: Work a lot, spend a little. There’s no inheritance from a rich uncle or trust fund from daddy behind my trip. I just worked quite a bit (sometimes toeing the line of insanity) and didn’t put all the money towards instant gratification. LN: What did your family think about your trip? PH: They were nervous for sure, but I think they knew it was coming a little bit. In 2007, I quit my job to do a 3 month trip around the US and Canada. I think that was a bit of a shocker for them, neither my parents or my brother seem to have my combination of wanderlust and irresponsibility. I was planning to ride on the other side of the world in places I knew nothing about, so they were more concerned about me actually making it home. My mom has reminded me in numerous occasions that I’m responsible for every gray hair she has. 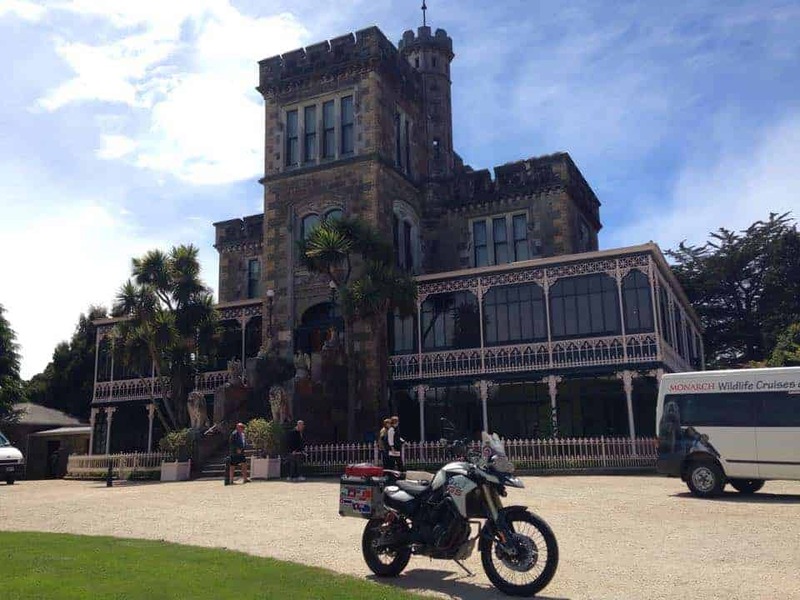 LN: How difficult was it to ship your motorcycle from place to place, and was it expensive? PH: In regards to difficulty, it varied quite a bit. 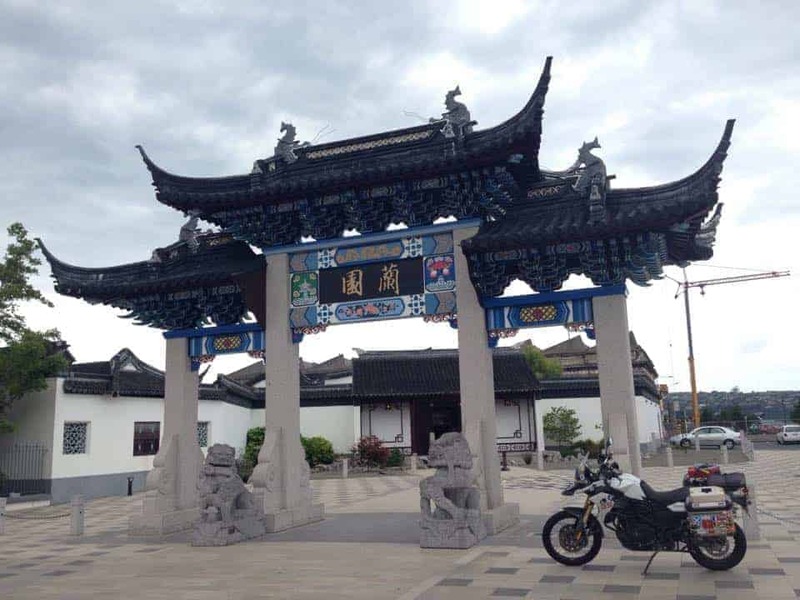 The two factors that affected it were the countries being shipped to and from and how commonly that route was used to ship motorcycles. My first shipment was from Canada to Scotland. I found a company whose entire business is flying motorcycles between Canada and the UK, so they had the whole process very well set up. I cleared my bike through customs in Scotland in about 30-45 minutes. In India it took 3 days and a couple taxi rides clear across the city to do various bits of paperwork. On the opposite end of the spectrum was my shipment from Istanbul to Mumbai. First off, that route doesn’t seem to be commonly used, so finding a shipping agent that would even work with me took a lot of time in itself. Then factor in customs on both ends and it was quite an ordeal. Just to show how much things can vary, I cleared my bike through customs in Scotland in about 30-45 minutes. In India it took 3 days and a couple taxi rides clear across the city to do various bits of paperwork. As far as cost, the flight for the bike was typically about 2x what my own ticket’s cost. Going by boat is a bit cheaper but takes much longer. Another note on going by boat…not only does it take longer for obvious reasons, but it also seems to be fairly common for there to be delays and route changes, making the timing fairly unpredictable. 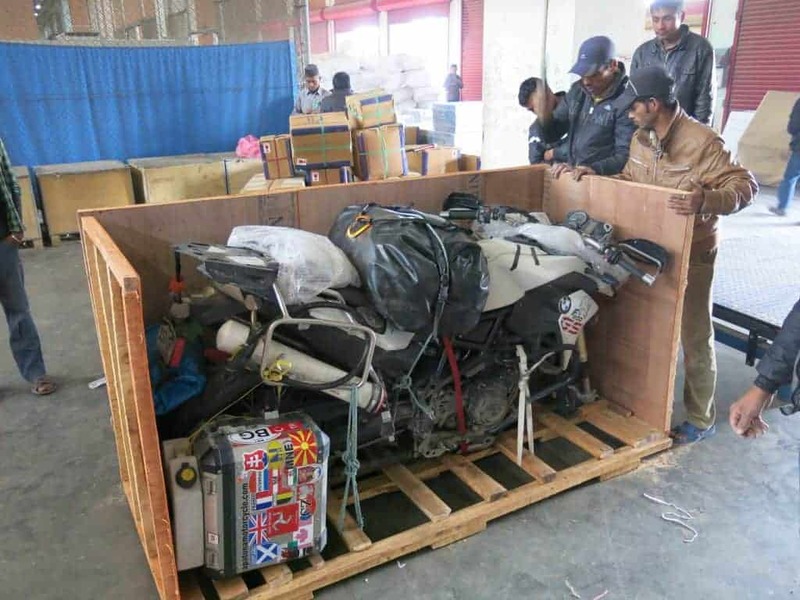 Shipping the bike in India. LN: We often preach that travel can change someone, and help them grow. What was the greatest lesson you learned? PH: The classic answer to this is something along the lines of how great and caring everyone around the world is or freeing yourself from your material possessions. Yeah, I can’t disagree with that, but everyone’s heard that so many times that you don’t need to travel to learn that, you just need to read a couple travel blogs. I learned, and will never forget that challenges and discomfort are what make life interesting and fulfilling. Pursue new interests, or take your current interests to the next level, and once you start feeling comfortable, repeat the process. As soon as you fall into a mundane and repetitive lifestyle, that is when life will pass you by before you know it. To put it simply, don’t live life casually. LN: Did you go back to your old career afterwards or did things change? PH: I was going to, but plans changed about 6 months into the trip. After quitting my job, my boss offered to let me take a one year leave of absence, which I really appreciated. I started to realized that I still had no interest in going back to my own job. I felt that as a trip of this magnitude could very well be a once in a lifetime thing, maybe I should extend it a bit, as that would be much more feasible than planning another trip like it a couple years later. So, the 10 month trip turned into 20 months. I’d taken up welding as a hobby and always really enjoyed it, and I had gotten bored of sitting at a desk in my old job. Upon getting home, I went to welding school and am now working in that field. Just hanging out on a cliff side. LN: What’s your next big project? How can our readers support you? PH: Right now I’m trying to spend my time learning more about welding and metal working. Maybe that’ll turn into a side business in the future. Next big project will probably be building a motorcycle, and a few years down the line, I’d like to build a cabin in the mountains. Pat finally made it home to Colorado. Challenge yourself. Conquer the challenge no matter the difficulty. From riding a motorcycle around the block to riding one around the world. Keep setting goals and knock them out. Never be comfortable. See the world and take it all in. There is one life to live, and there are opportunities everywhere. Pat saved up and looked towards the future, then when after his challenge. He went around the globe, and learned that being behind the desk isn’t for him. The difficulties are what make this life interesting. Good luck…..